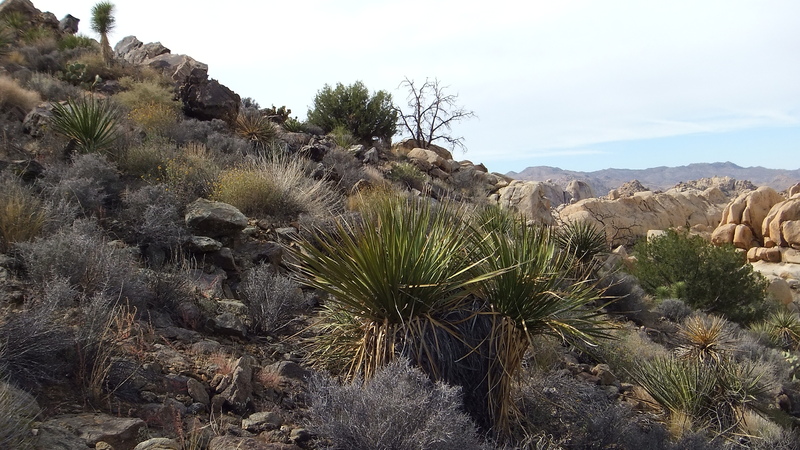 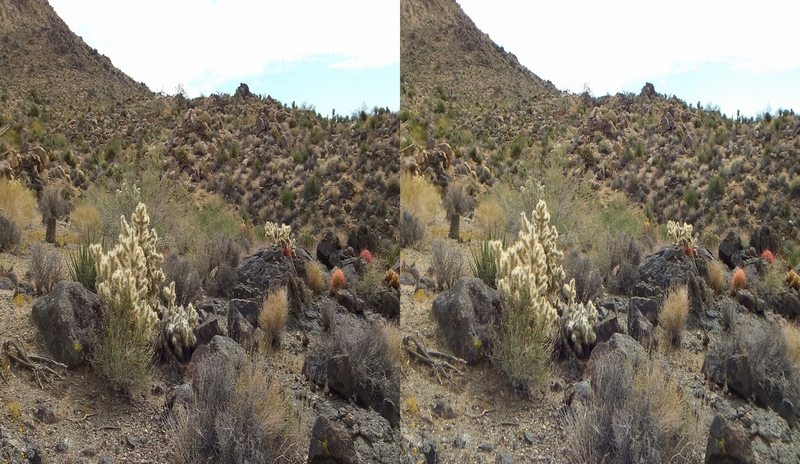 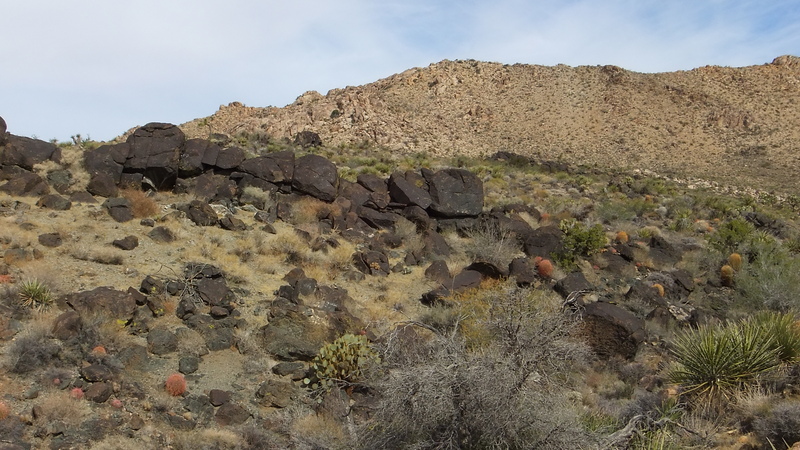 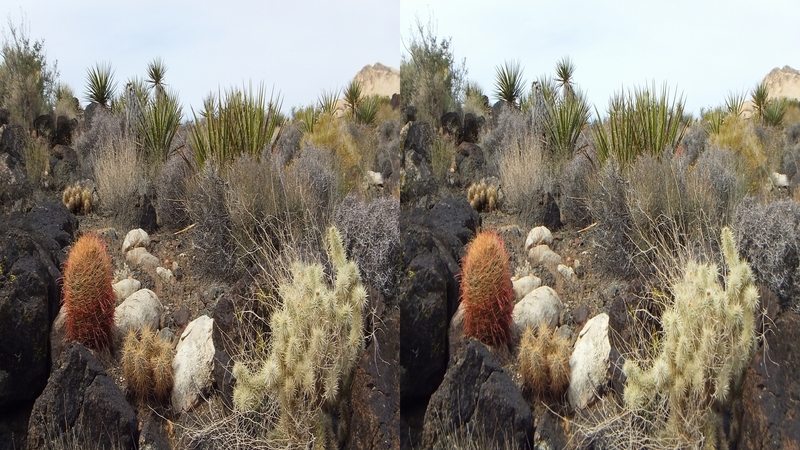 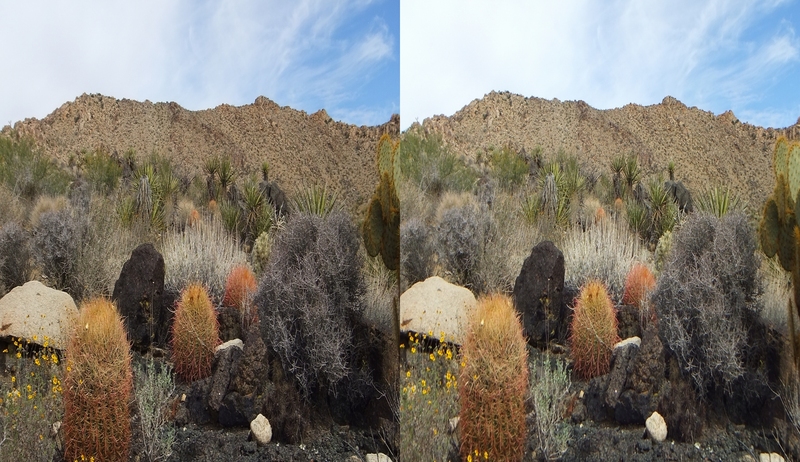 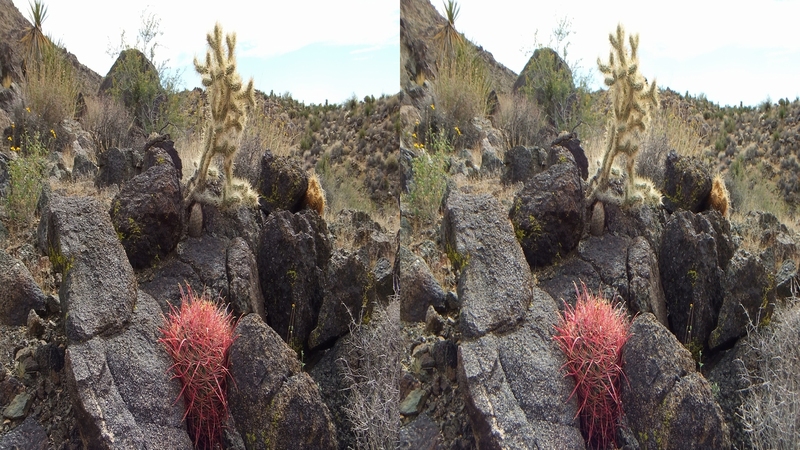 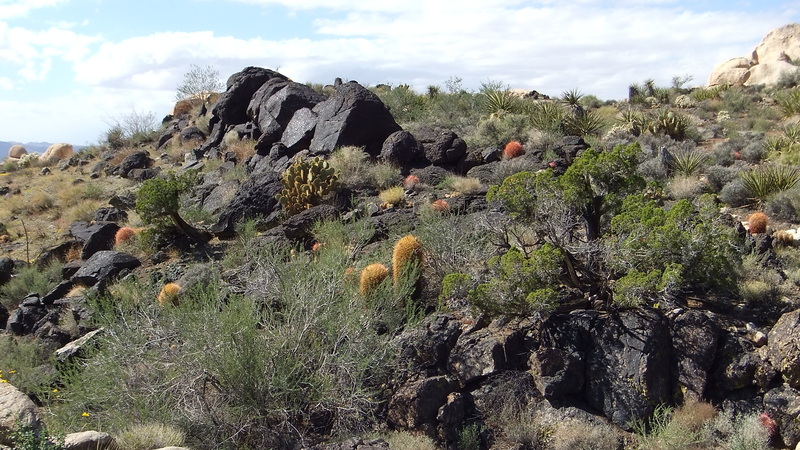 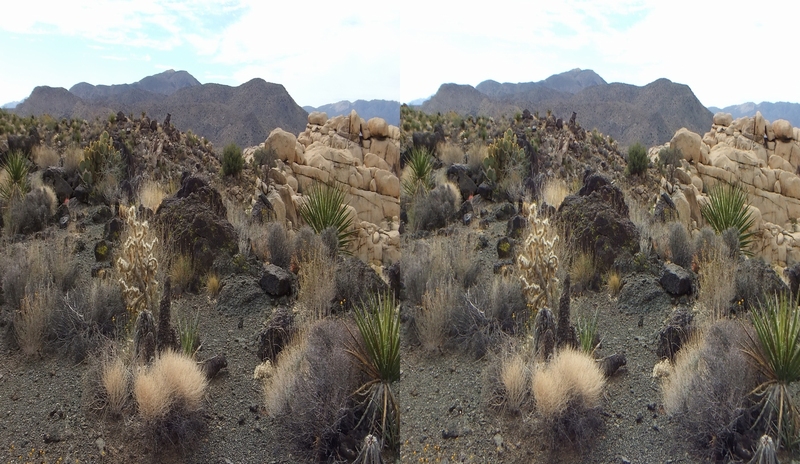 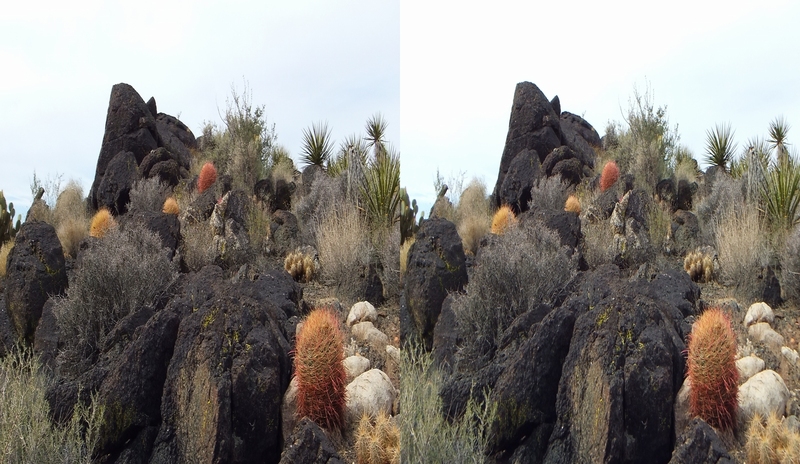 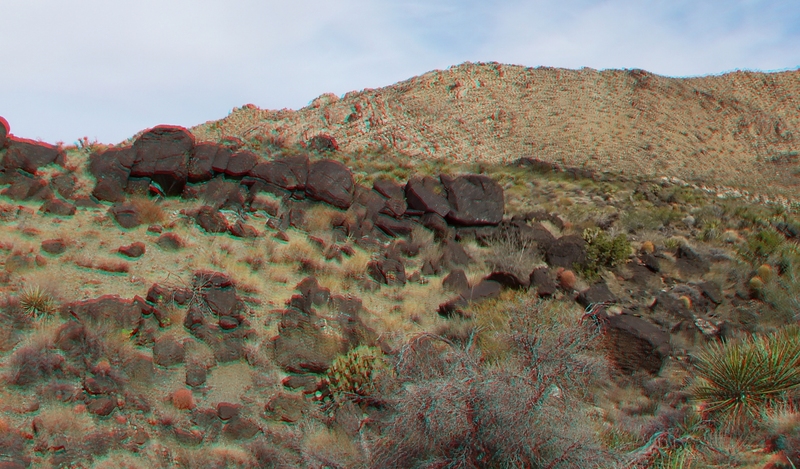 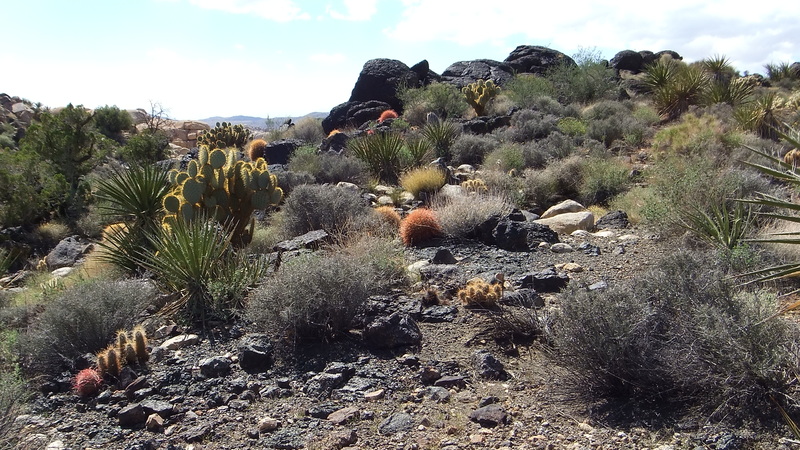 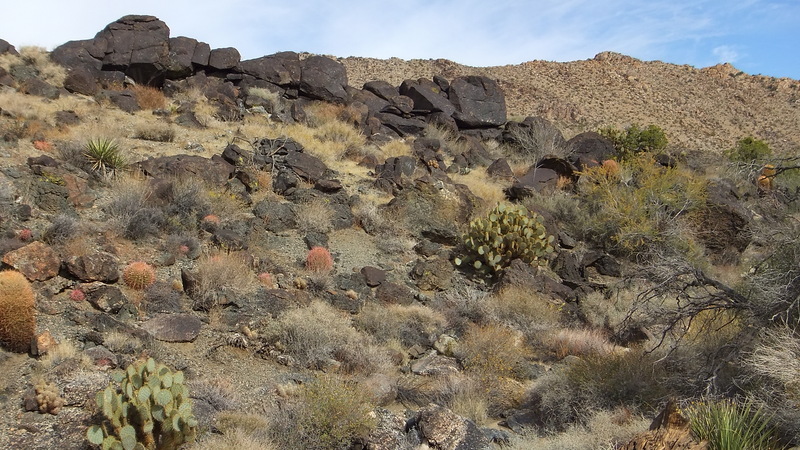 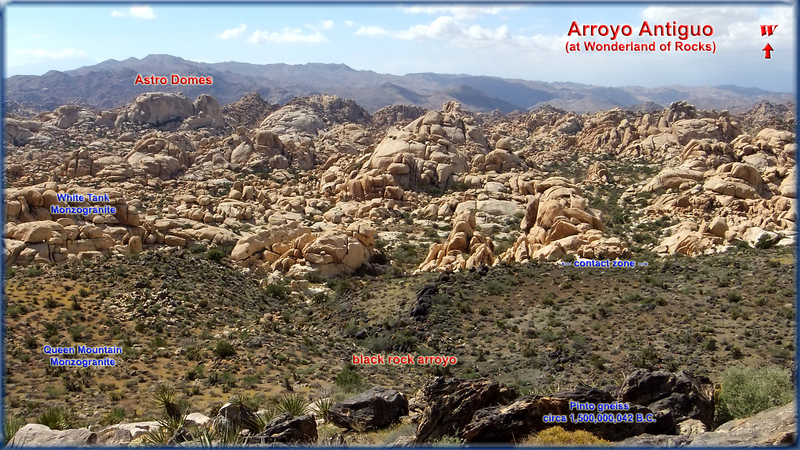 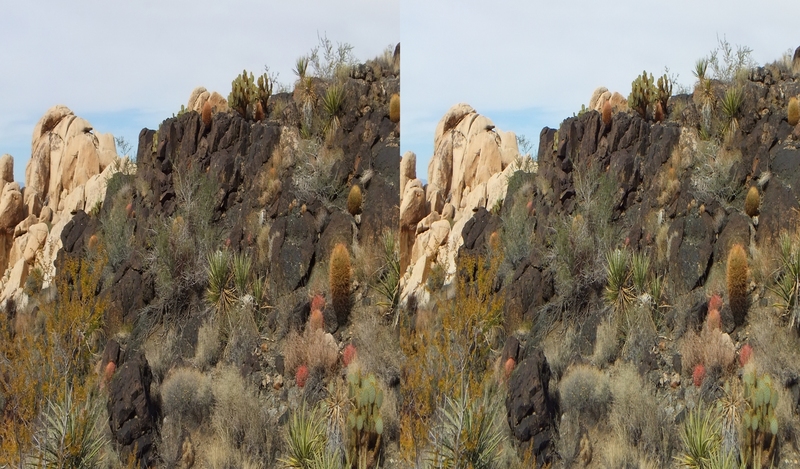 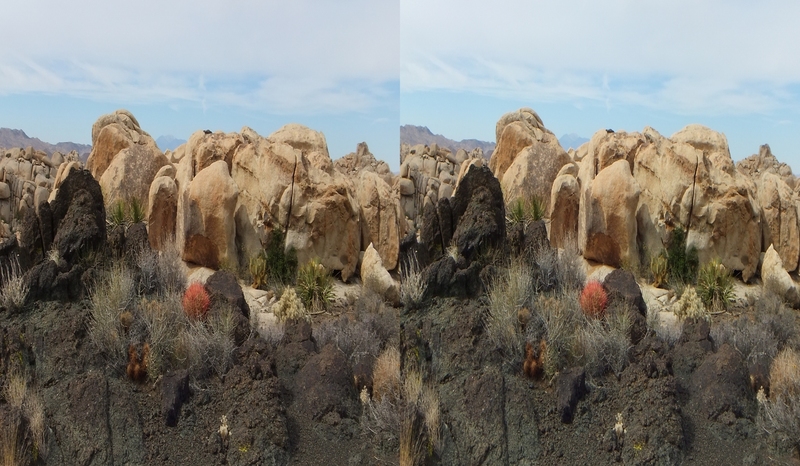 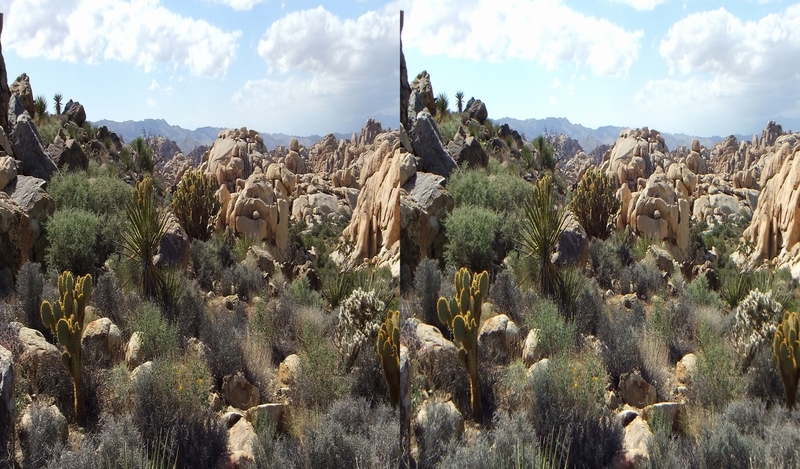 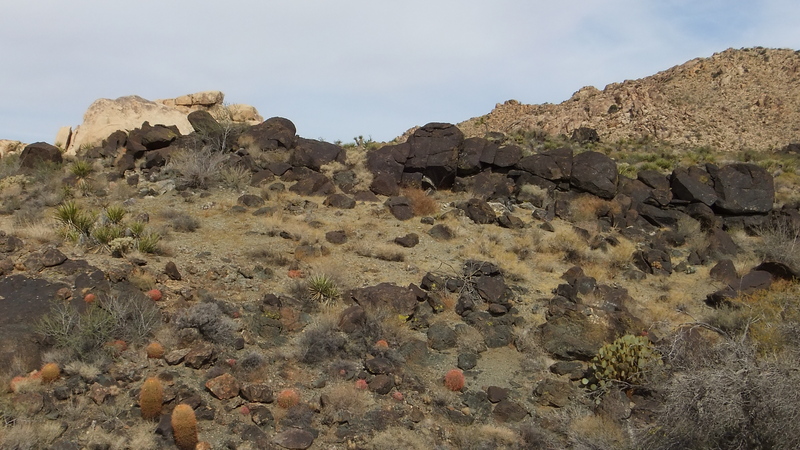 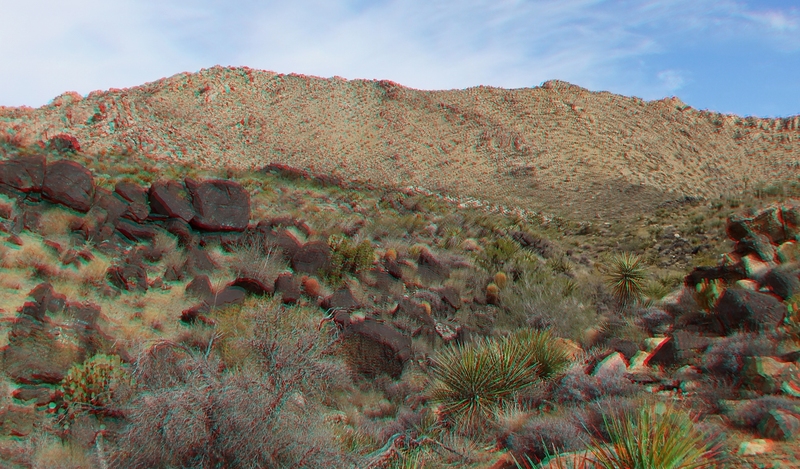 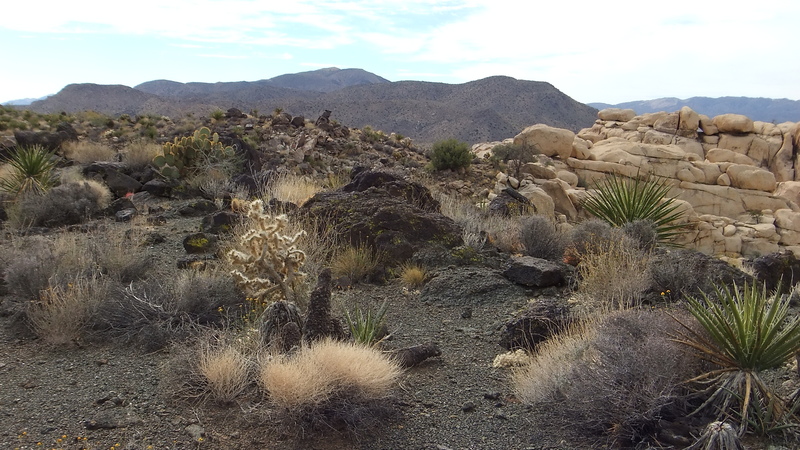 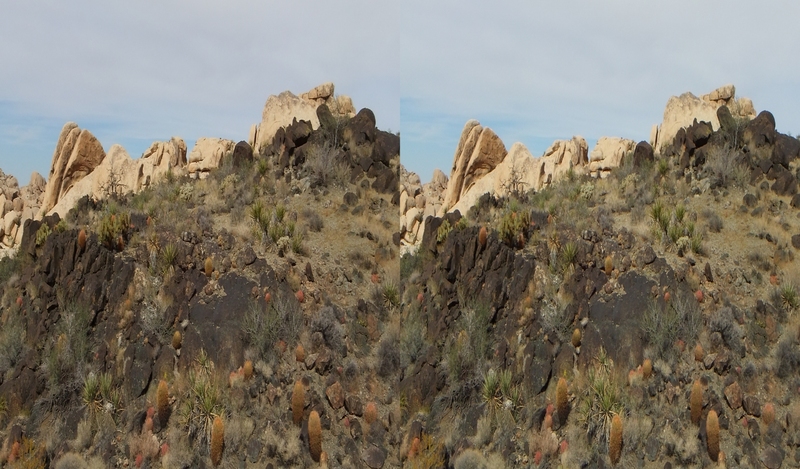 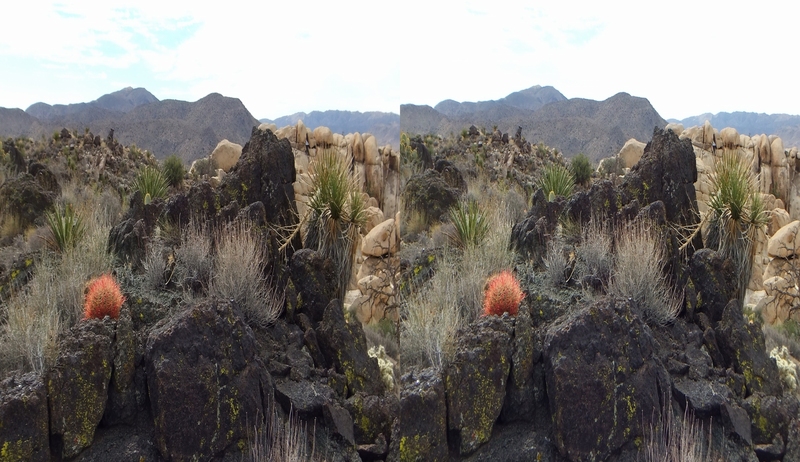 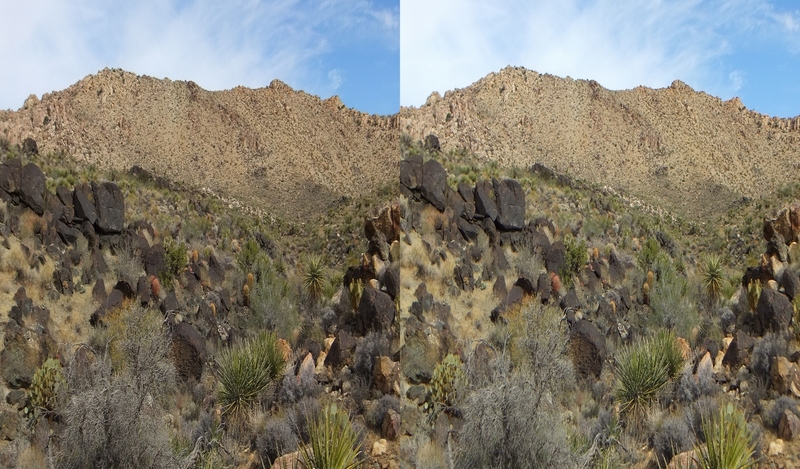 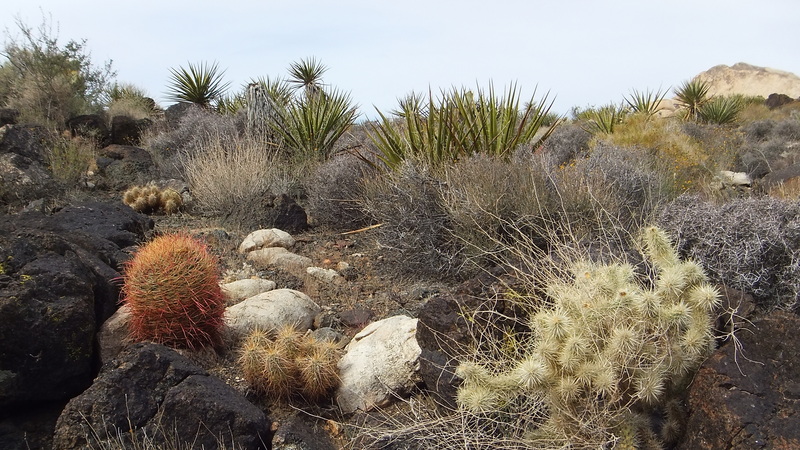 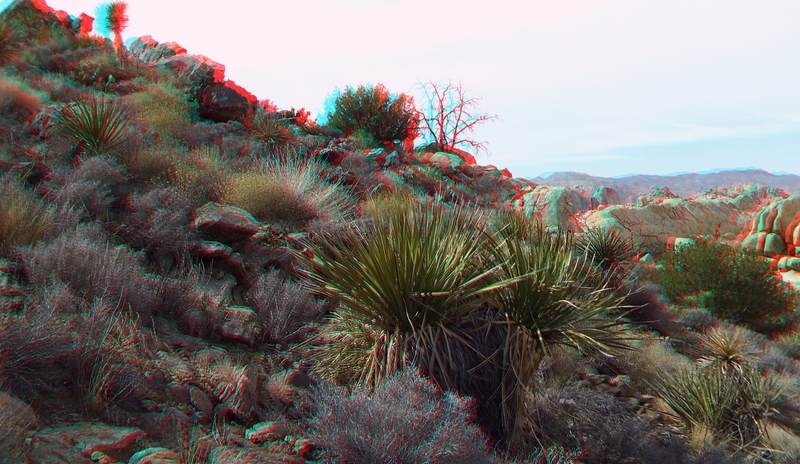 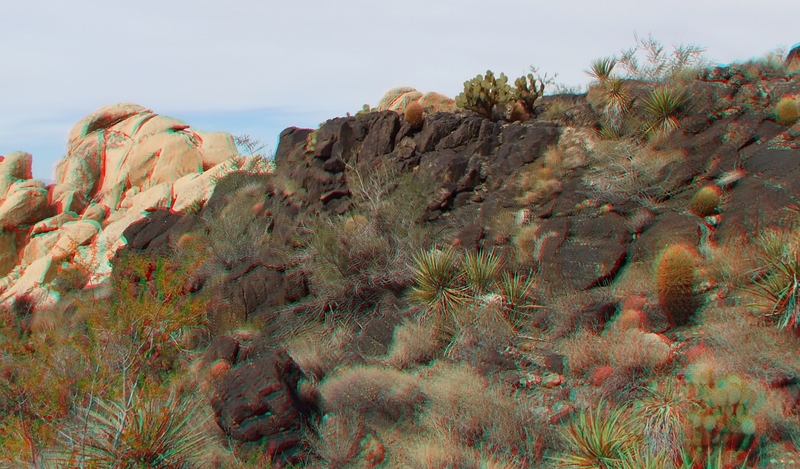 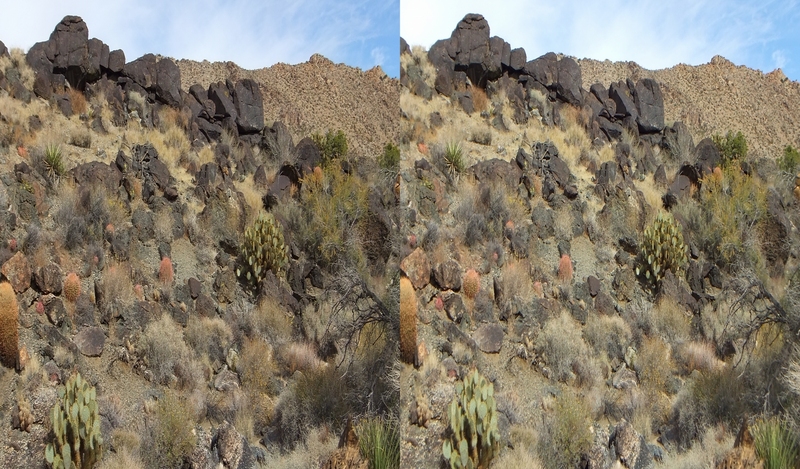 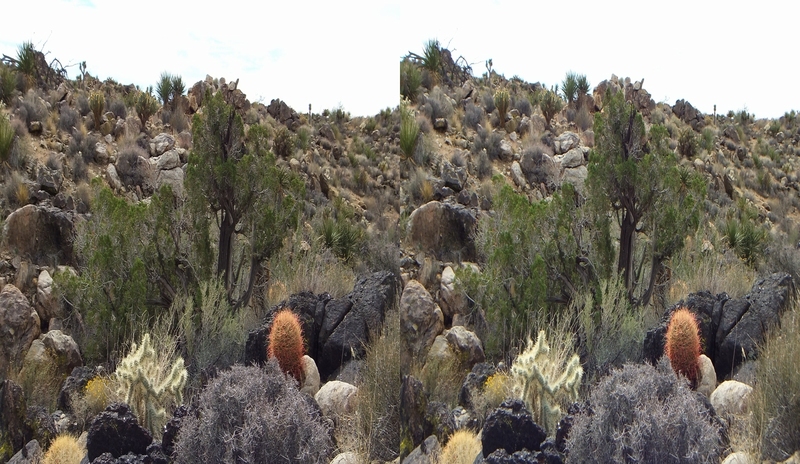 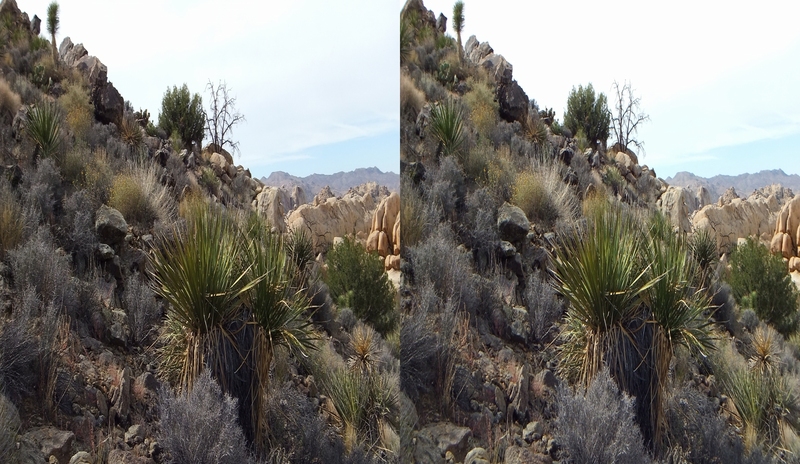 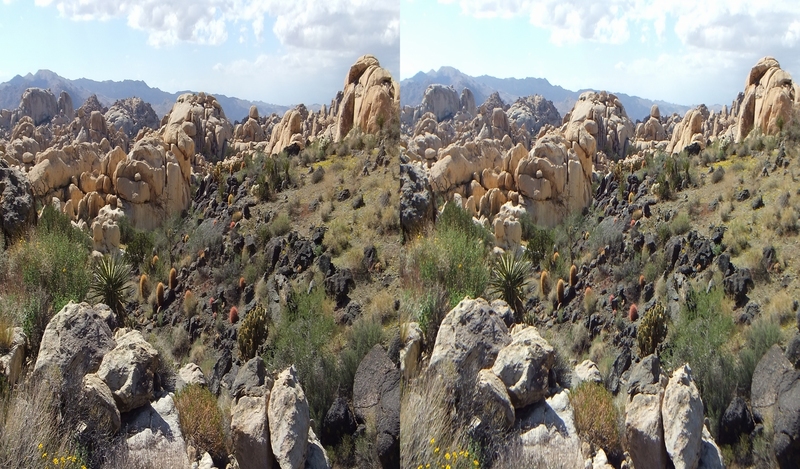 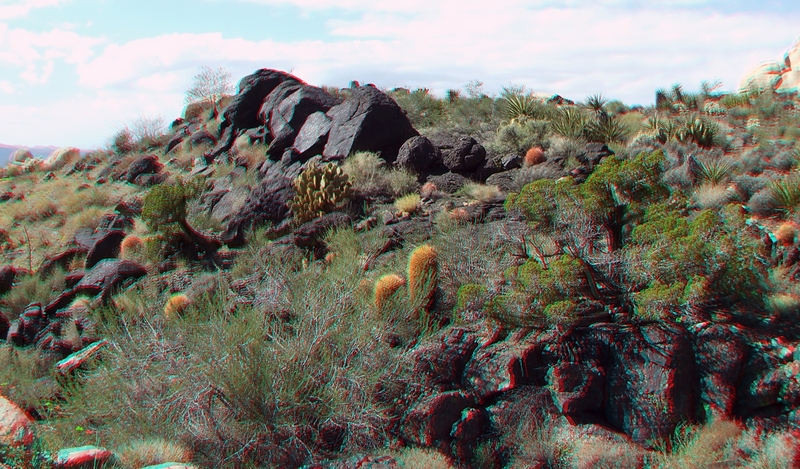 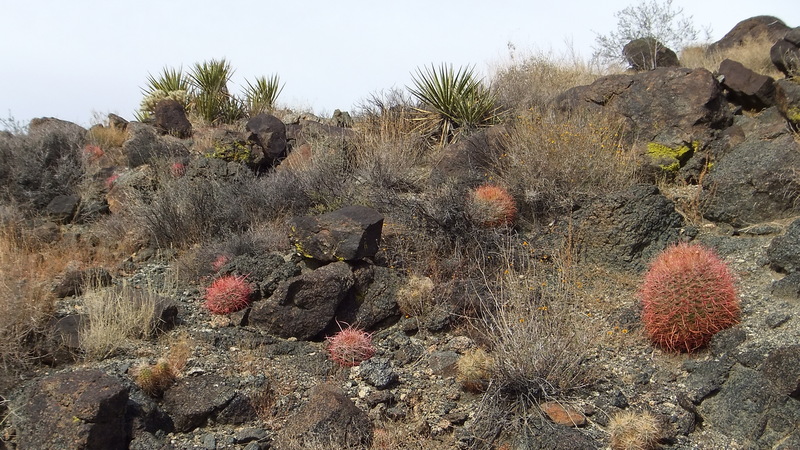 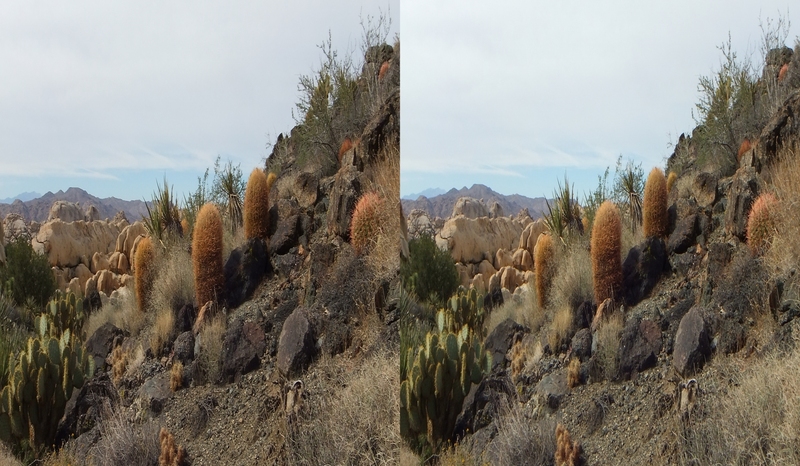 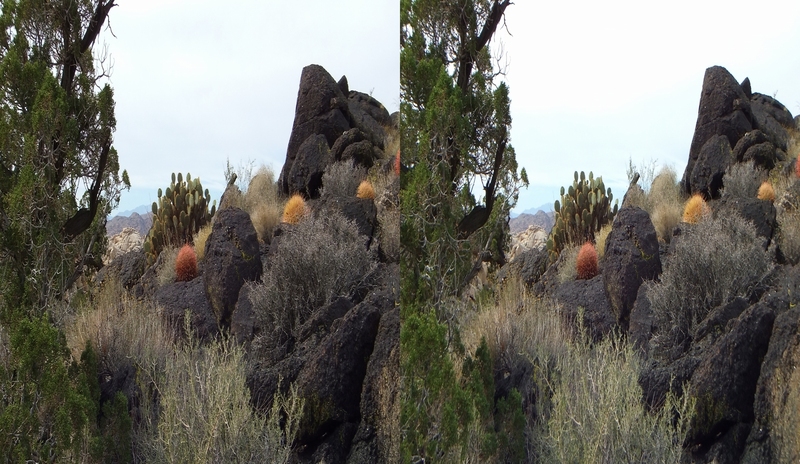 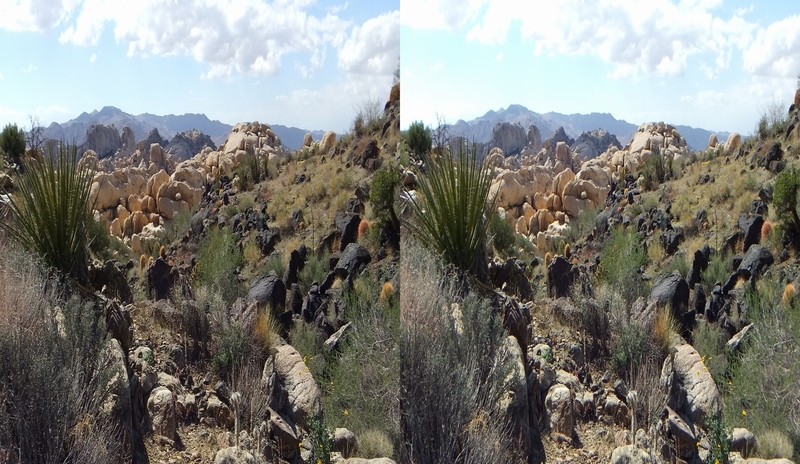 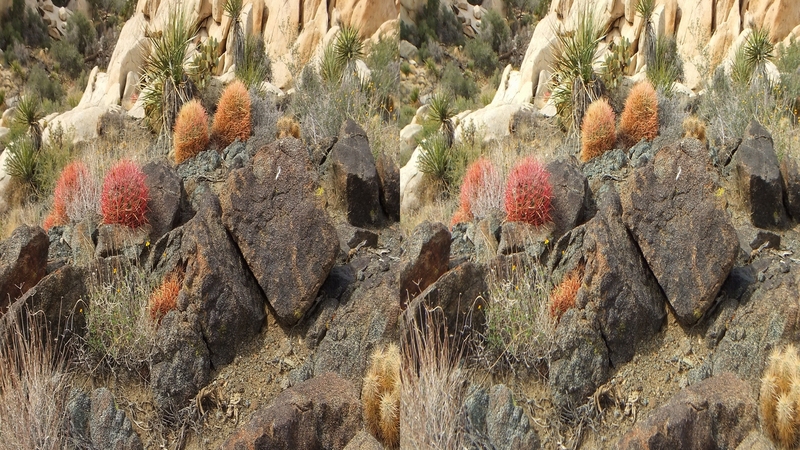 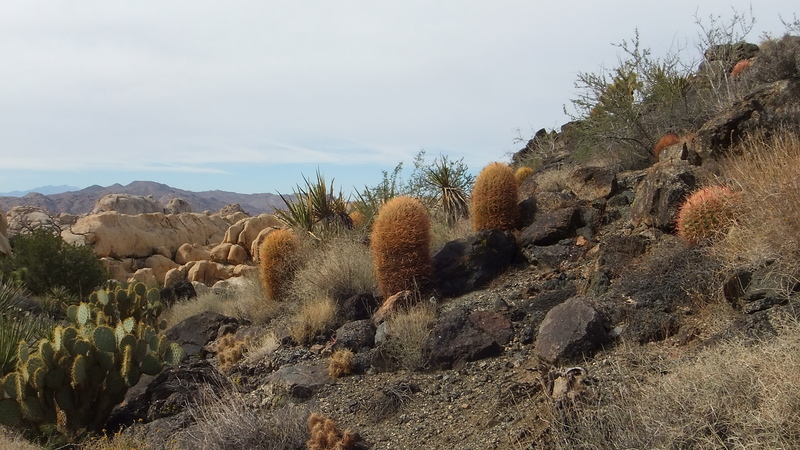 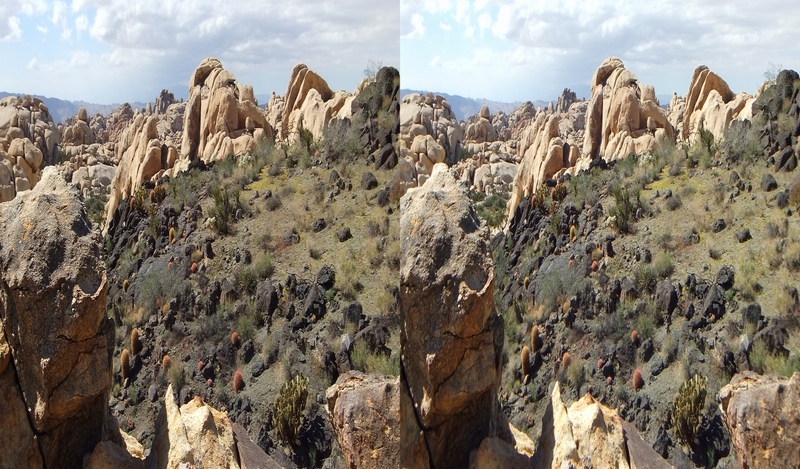 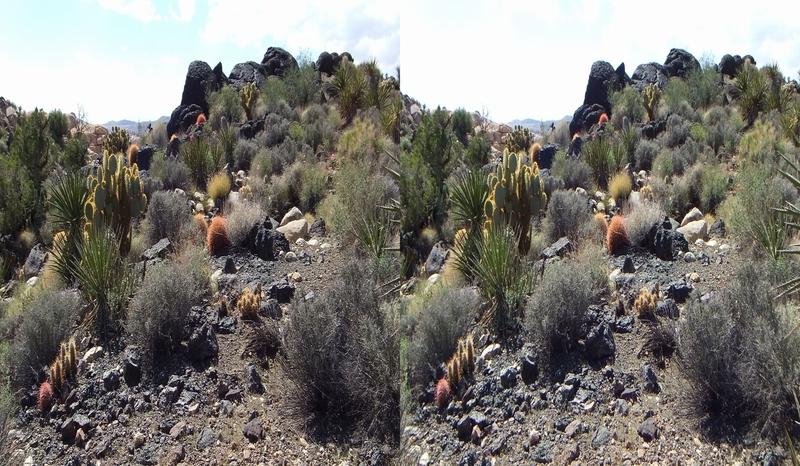 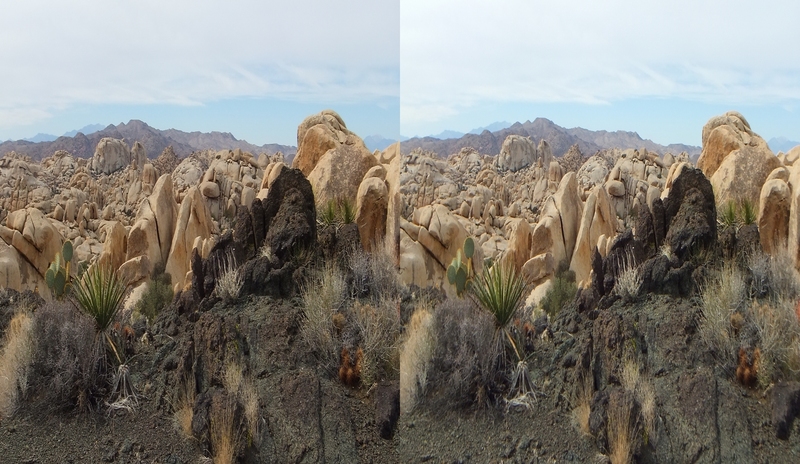 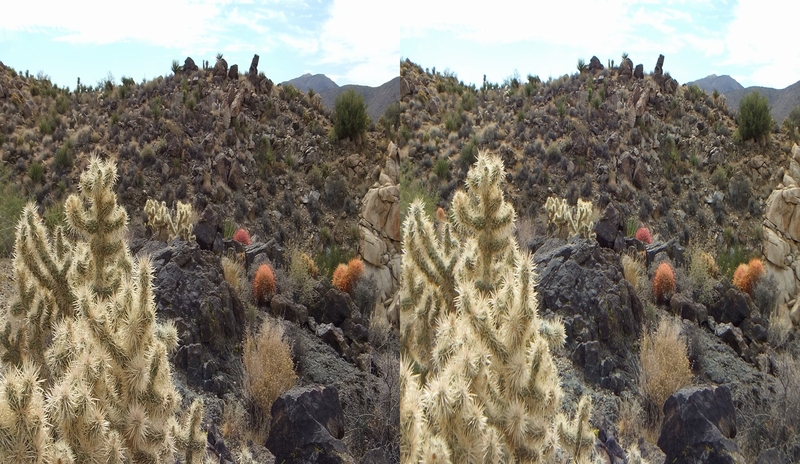 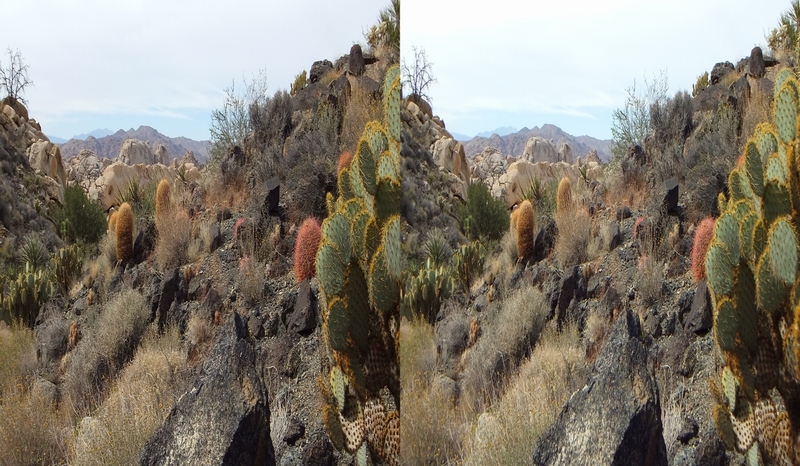 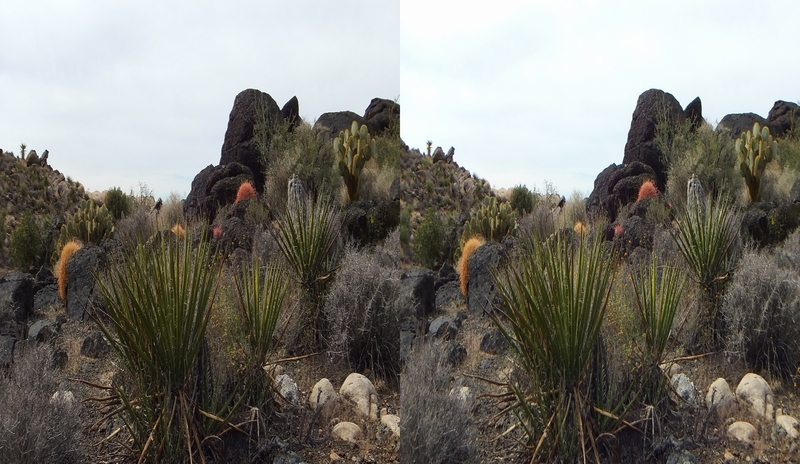 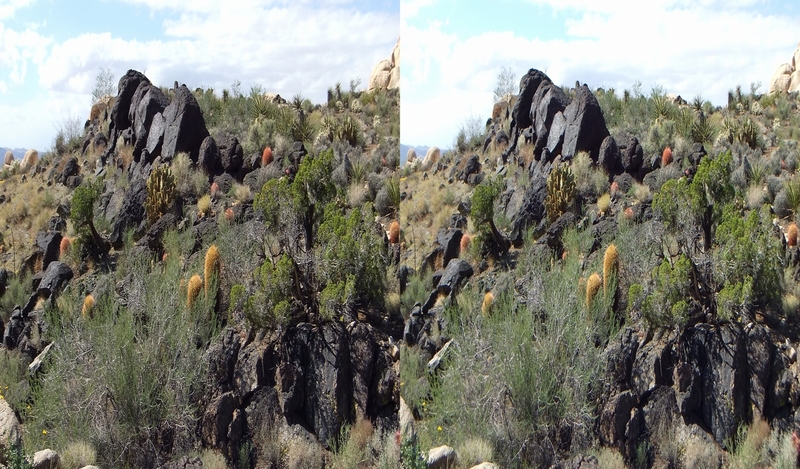 I decided to call this short, black-rock canyon arroyo antiguo. 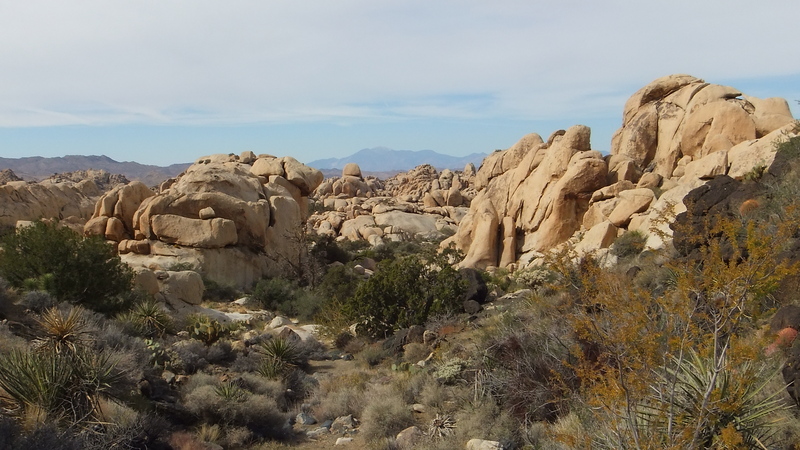 Ancient, it is; the granite rocks are up to 150 million years old with some of the dark Pinto gneiss boulders tipping the scale at 1.5 billion years! 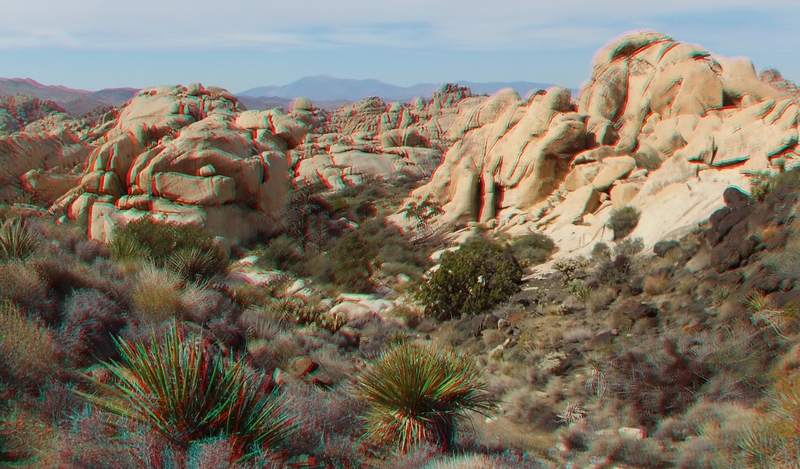 The title was chosen after the music that accompanies a six-minute slideshow I made of the best-of 3D photos taken there. 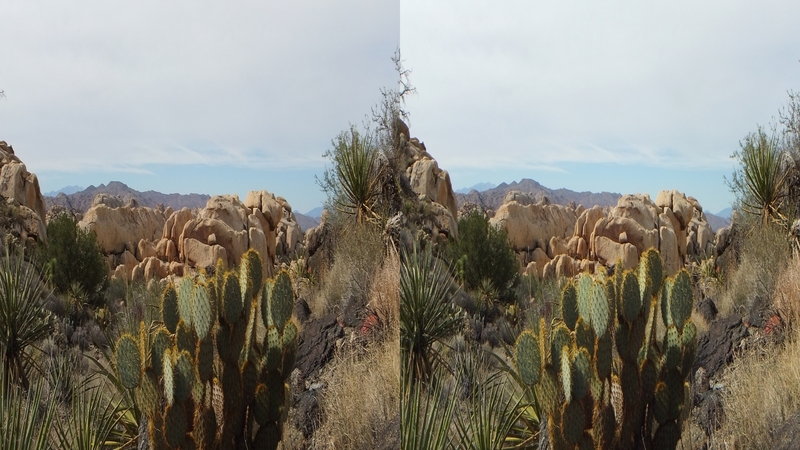 Benedetti & Svoboda’s “Arroyo Antiguo” provides the ideal theme music for recreating my two visits to the area. 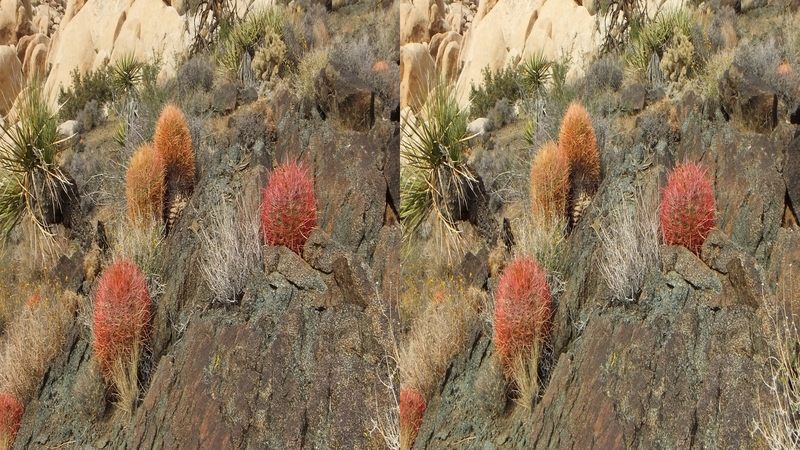 I could have selected another name, I suppose, but this ended up being the one. 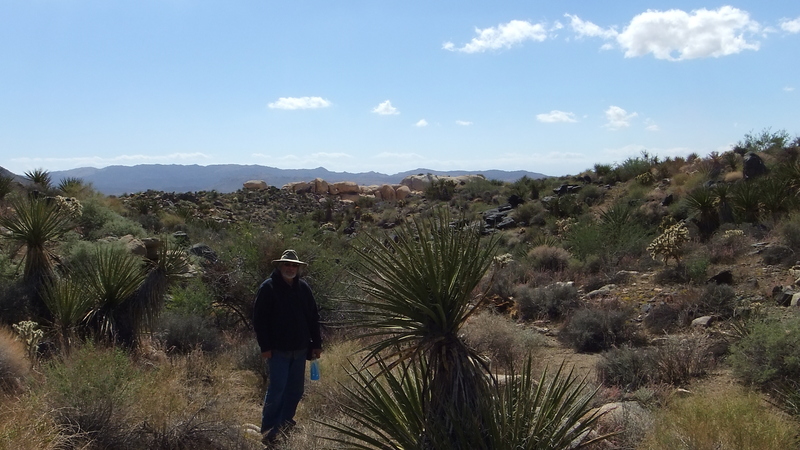 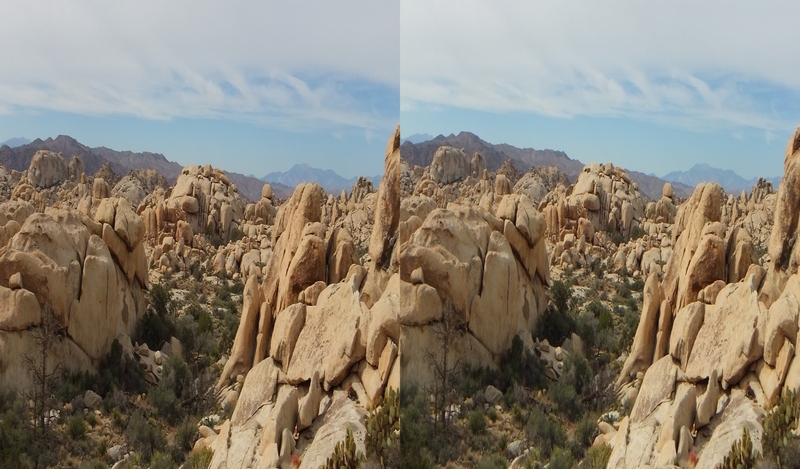 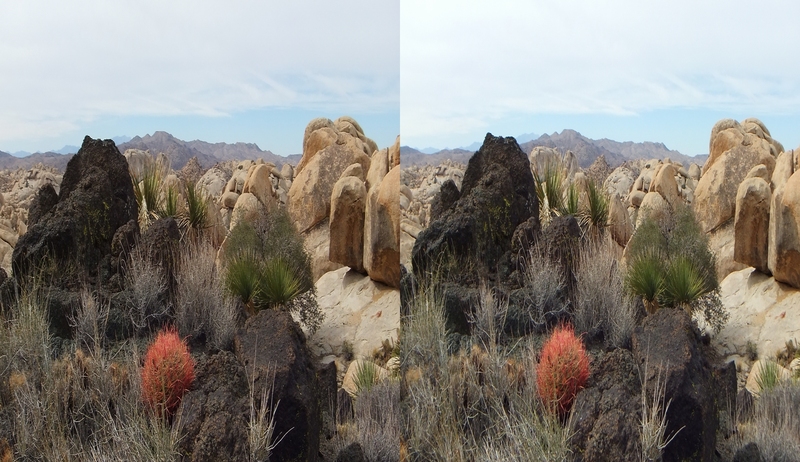 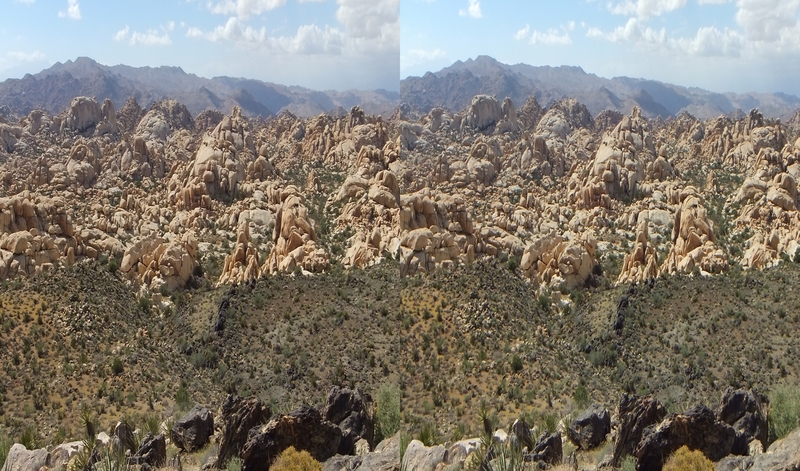 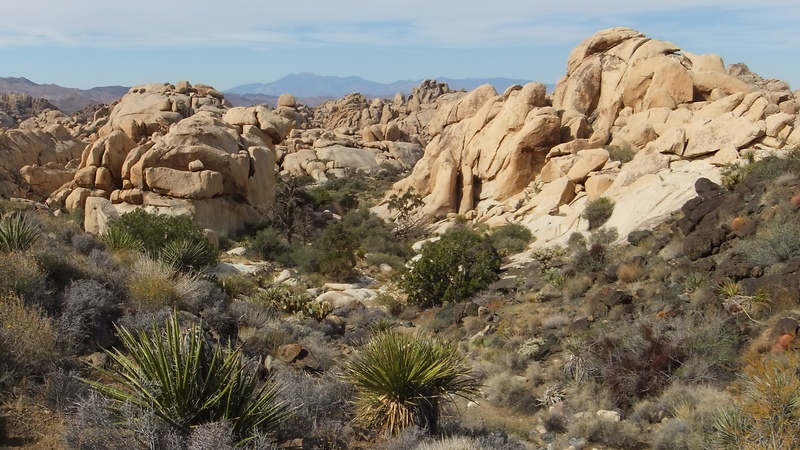 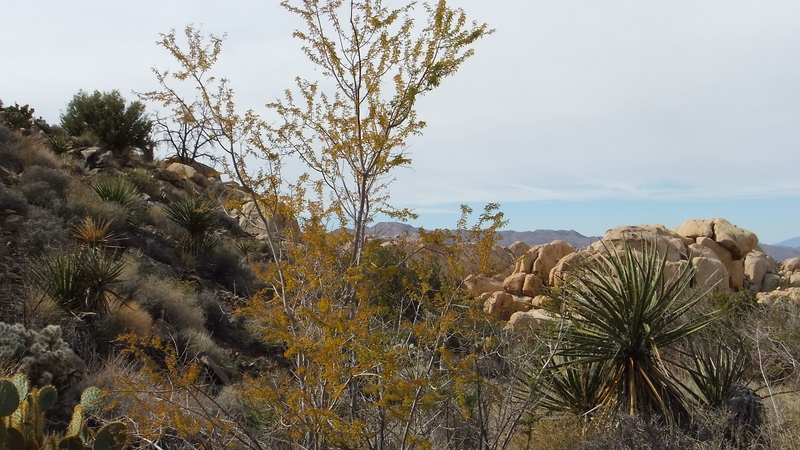 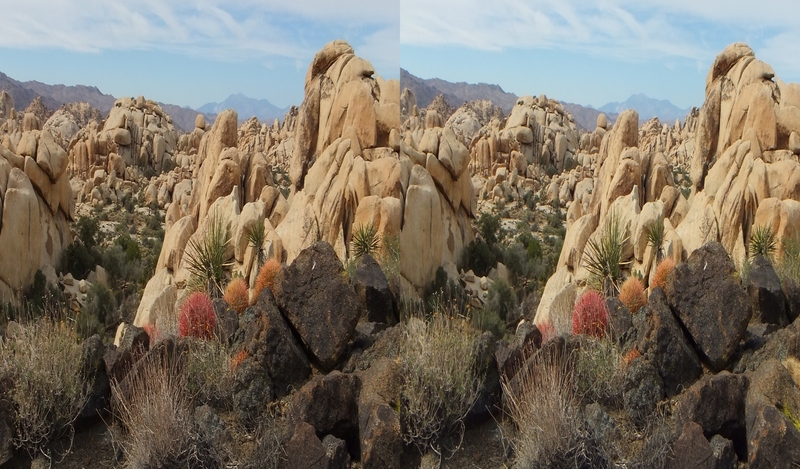 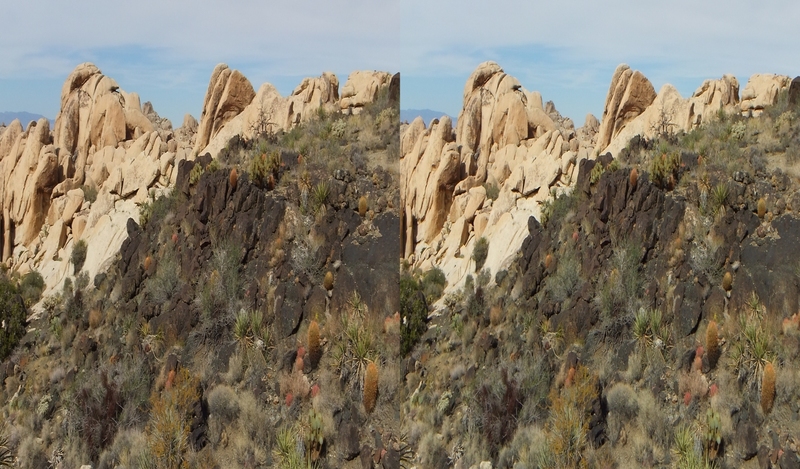 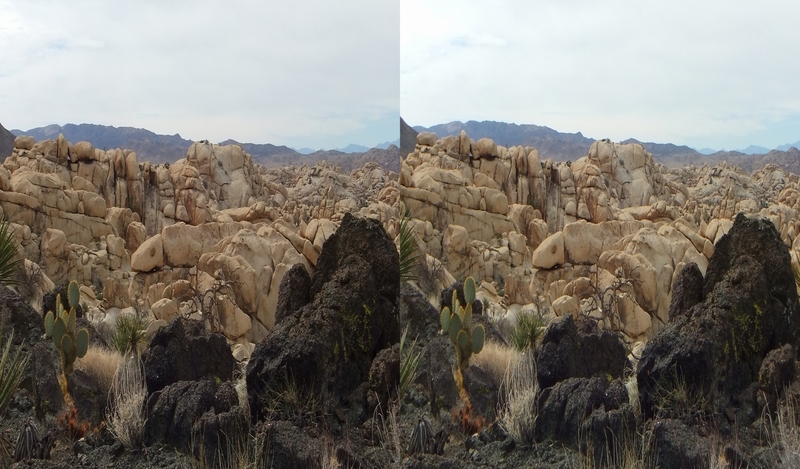 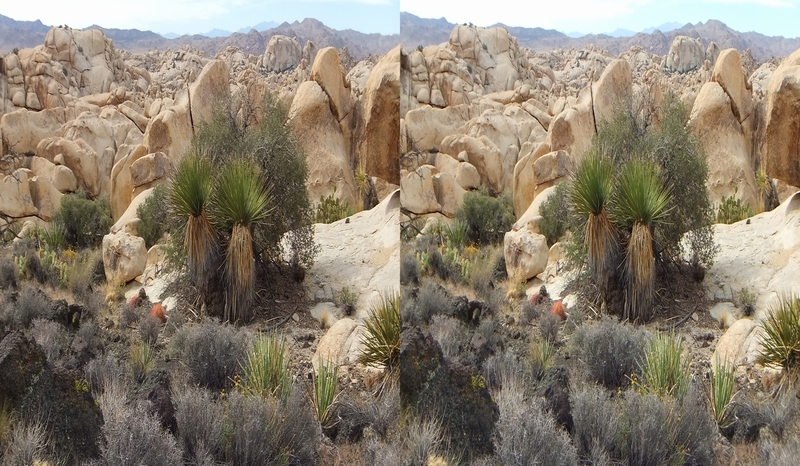 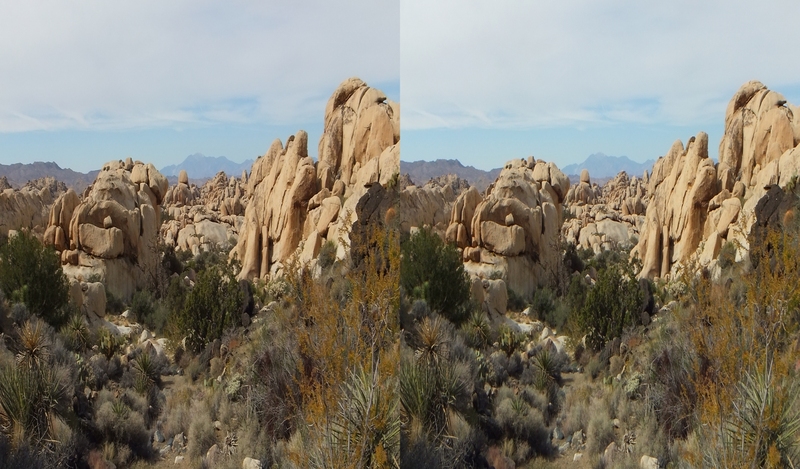 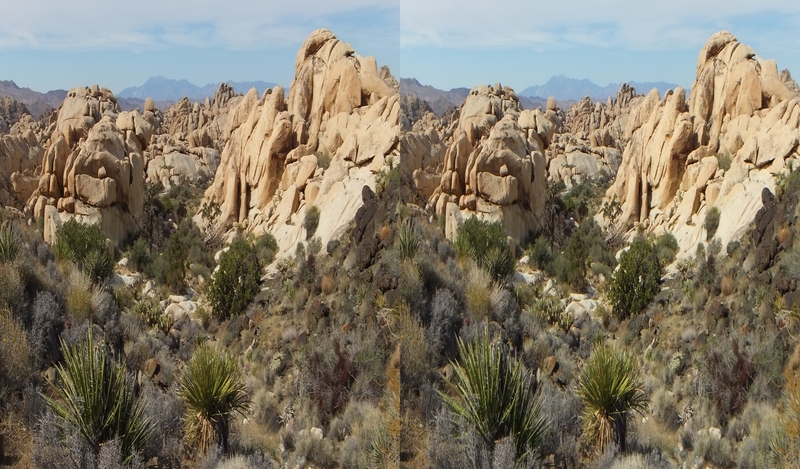 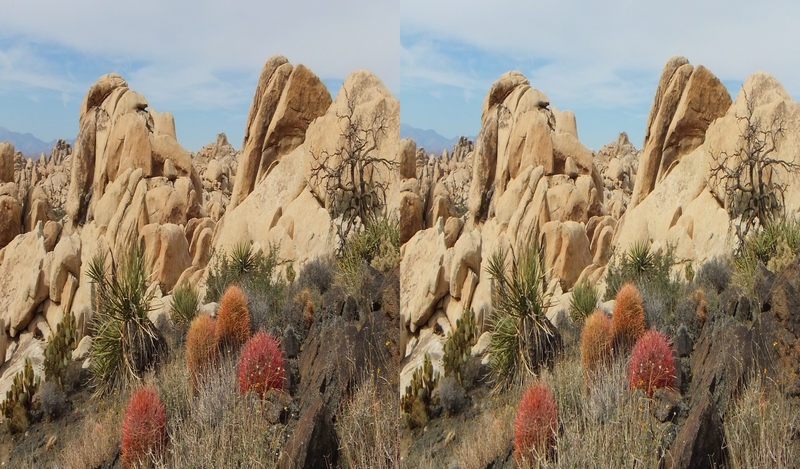 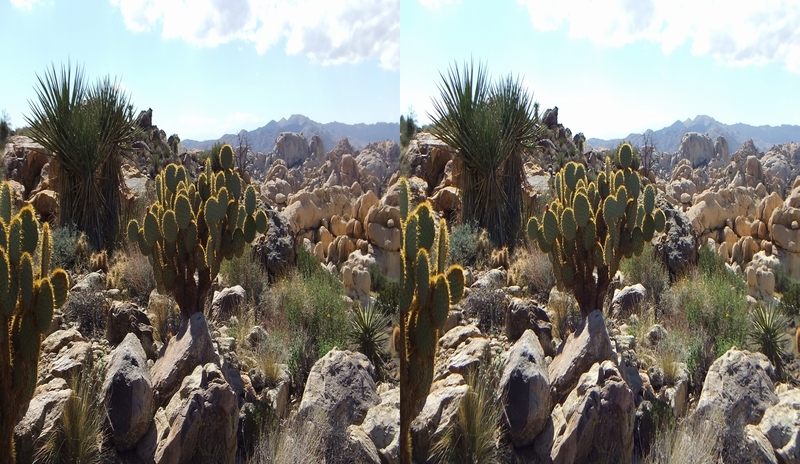 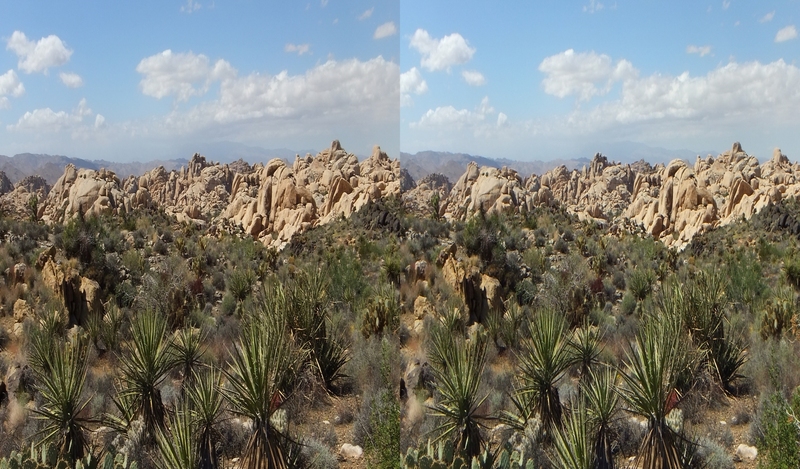 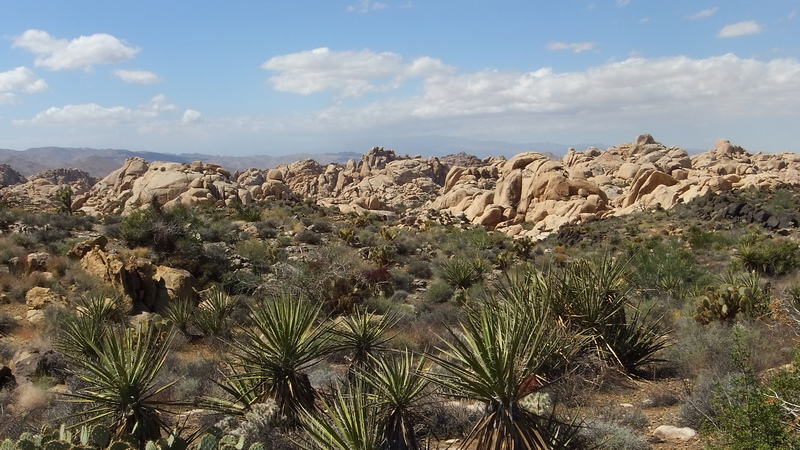 The area in question is unusual for Joshua Tree, which itself is a geologic outlier among johnny-come-lately National Parks one sees around the world. 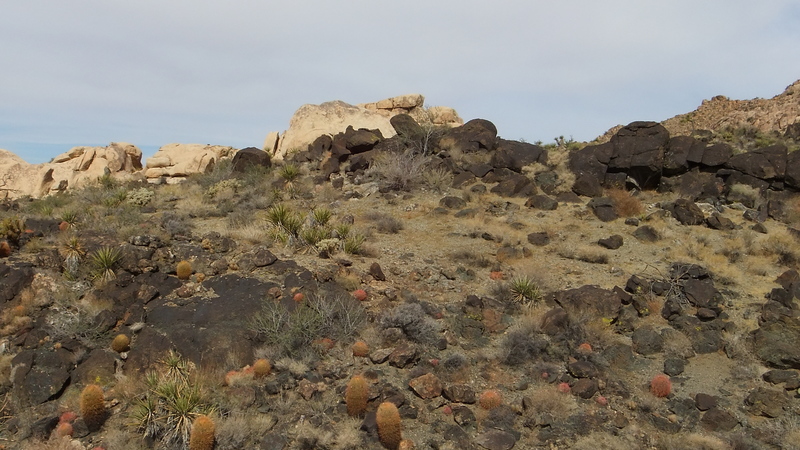 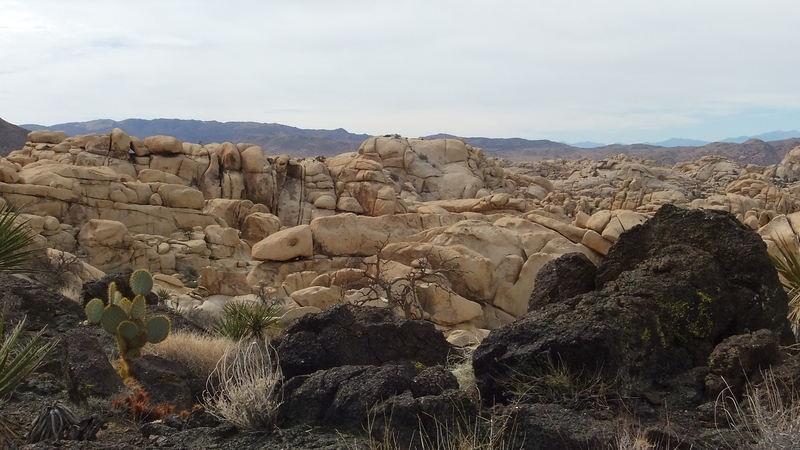 It forms a “contact zone” between ancient granitic formations. 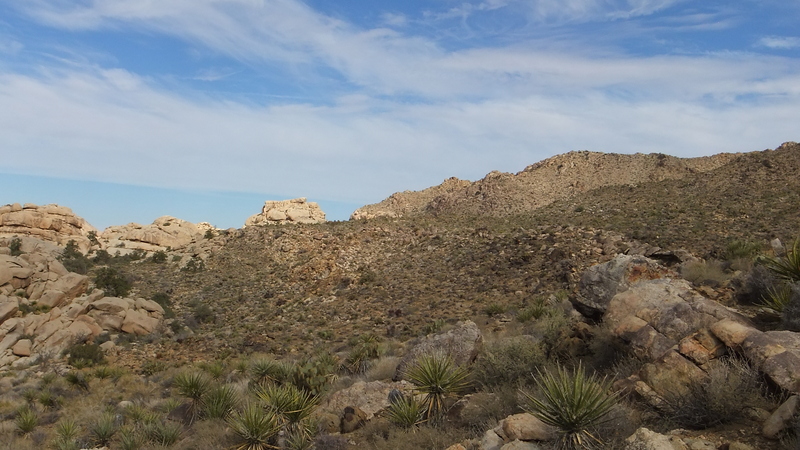 The lighter White Tank monzogranite provides the astonishing inselbergs and piles for which the park is justly famous. 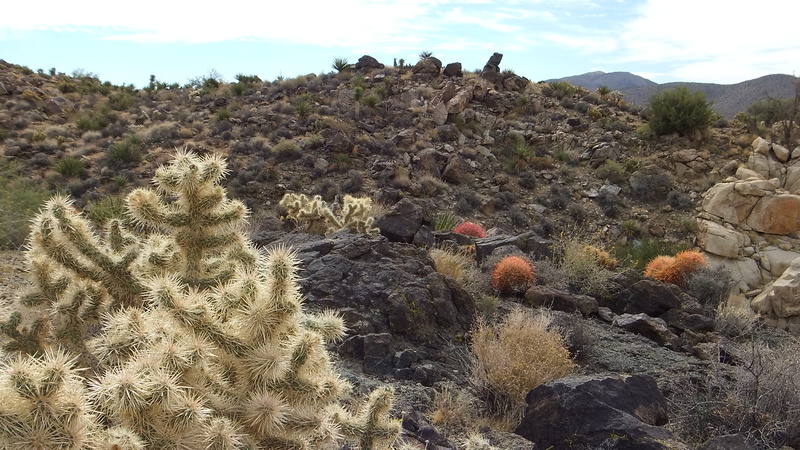 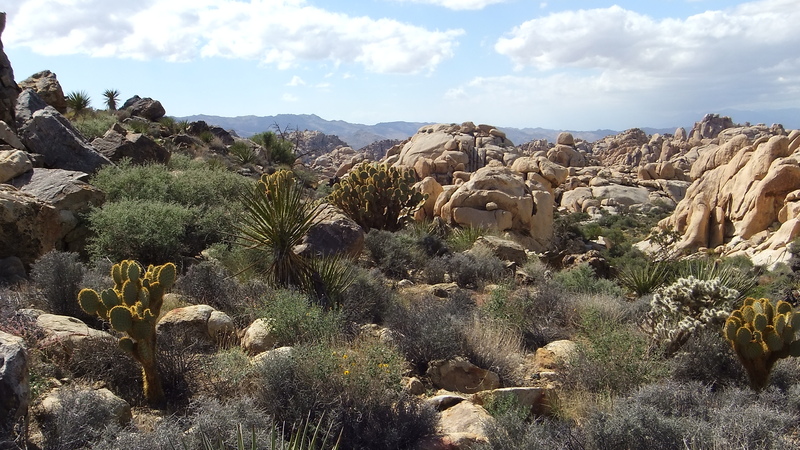 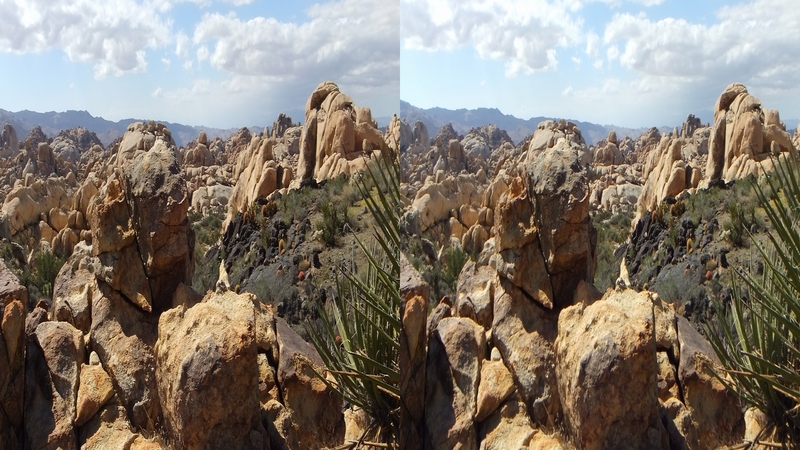 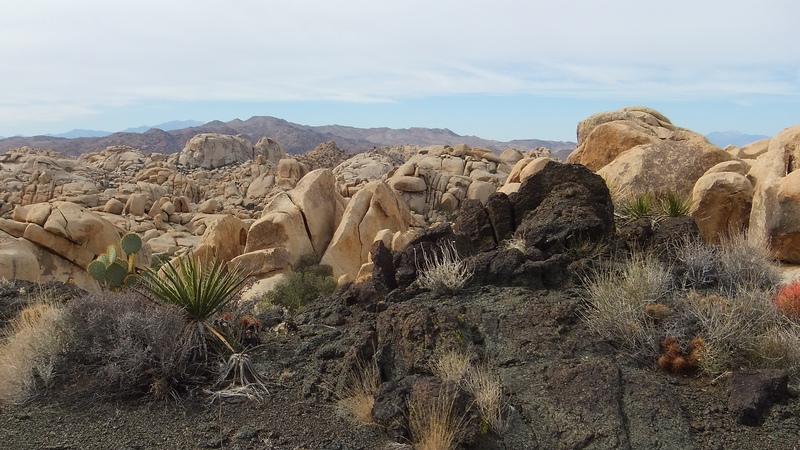 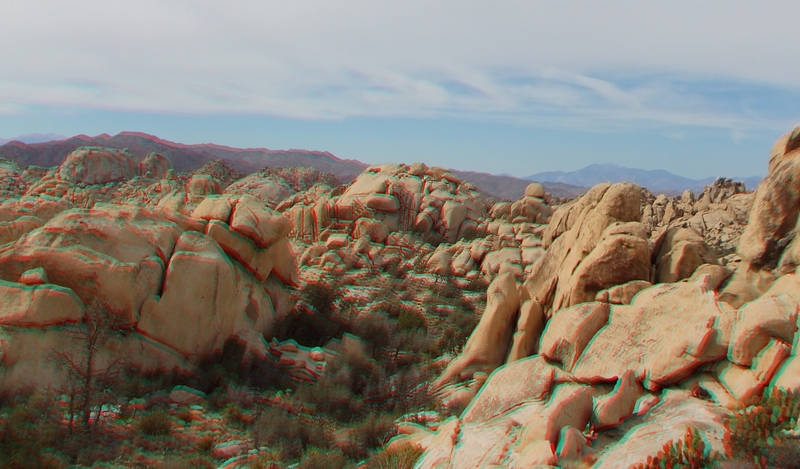 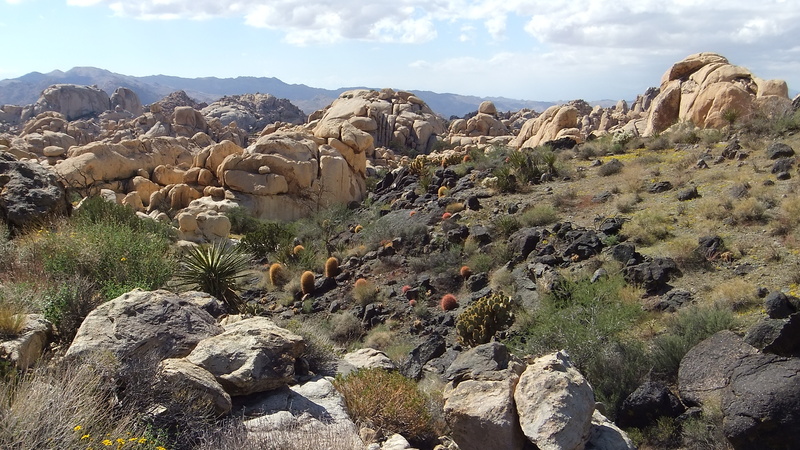 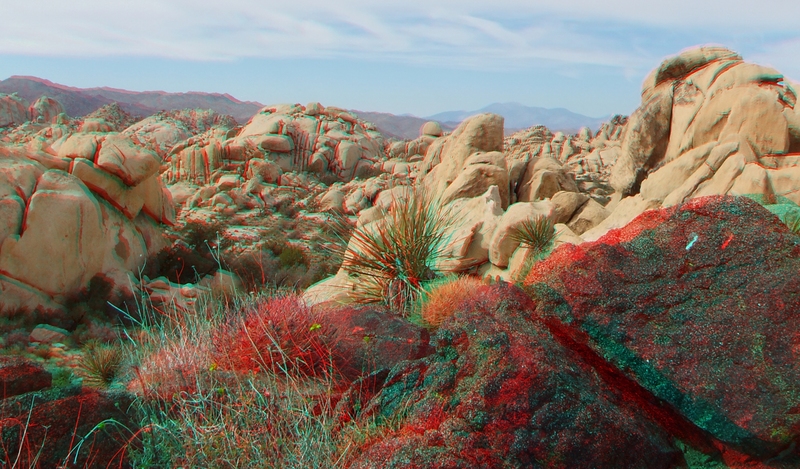 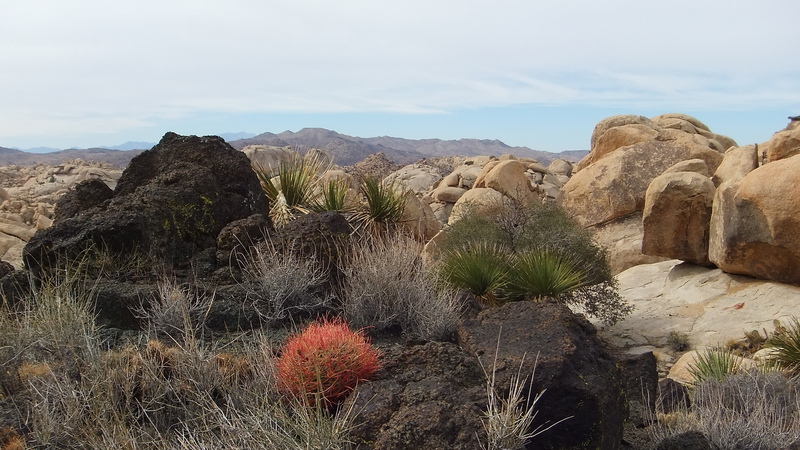 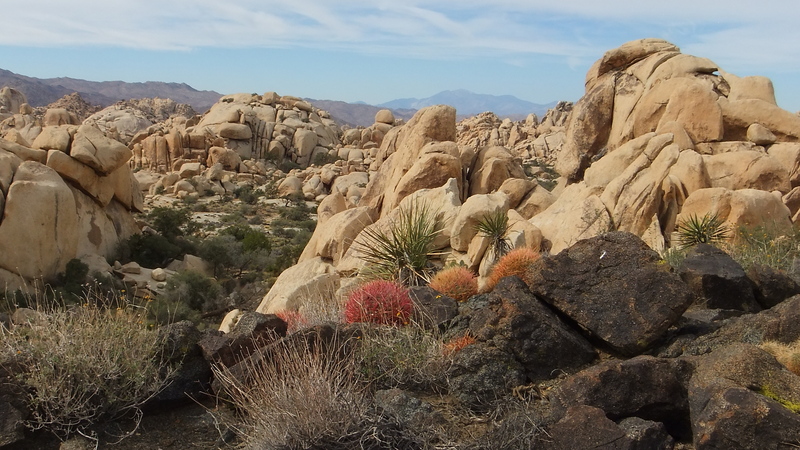 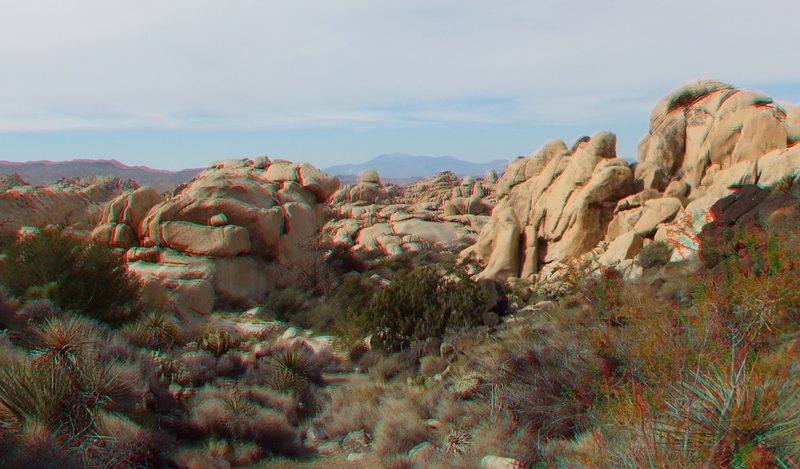 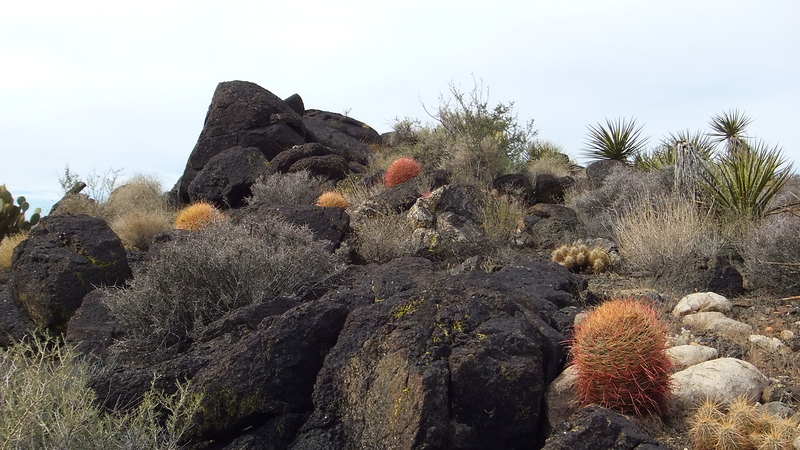 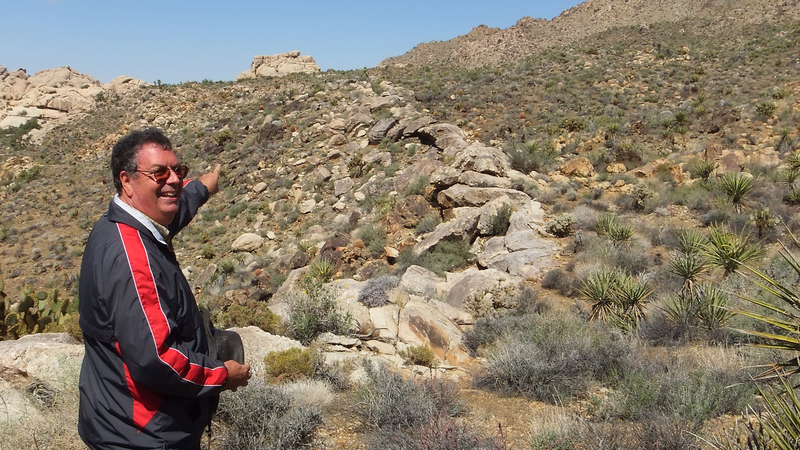 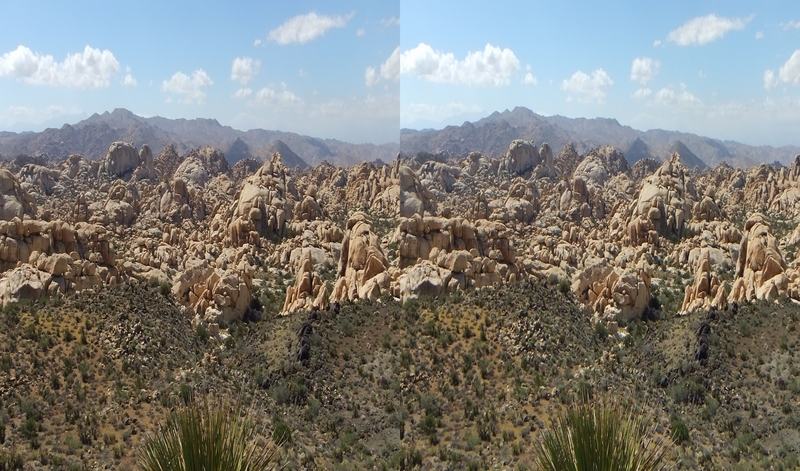 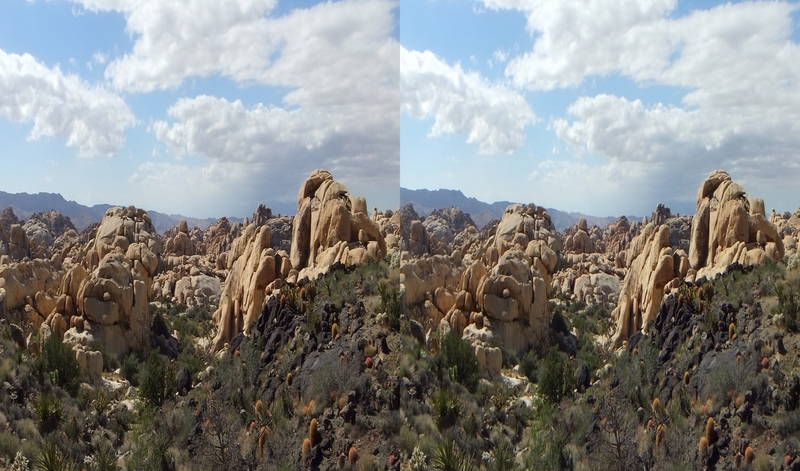 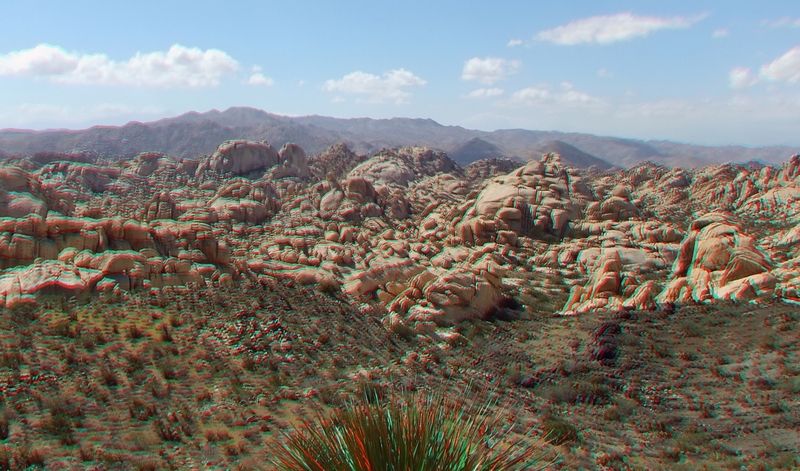 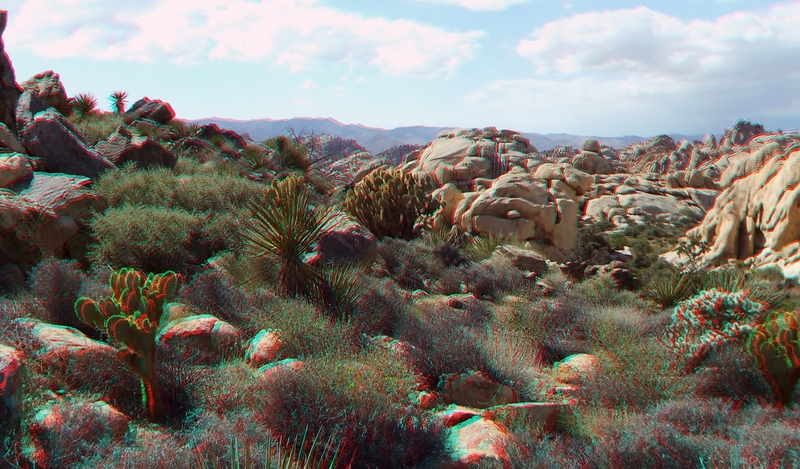 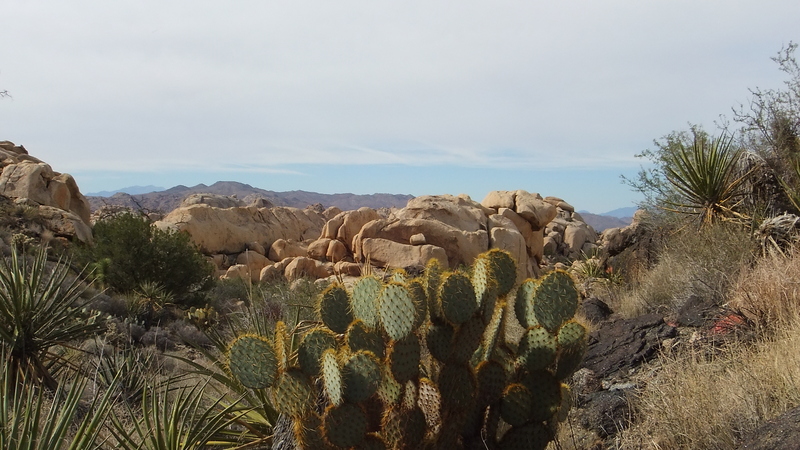 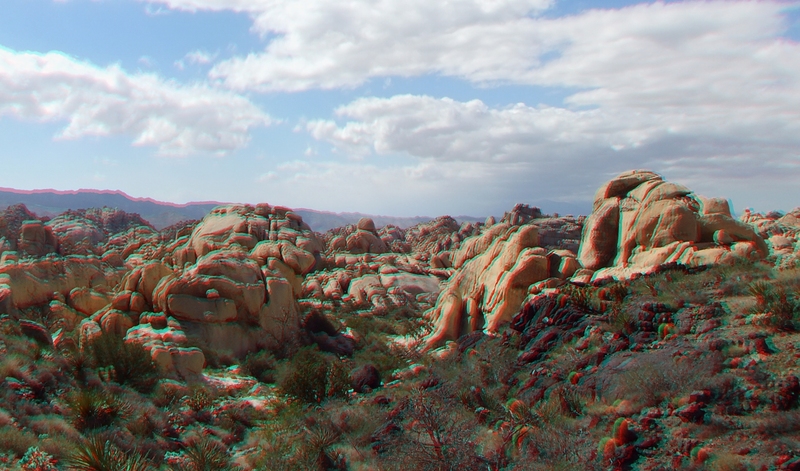 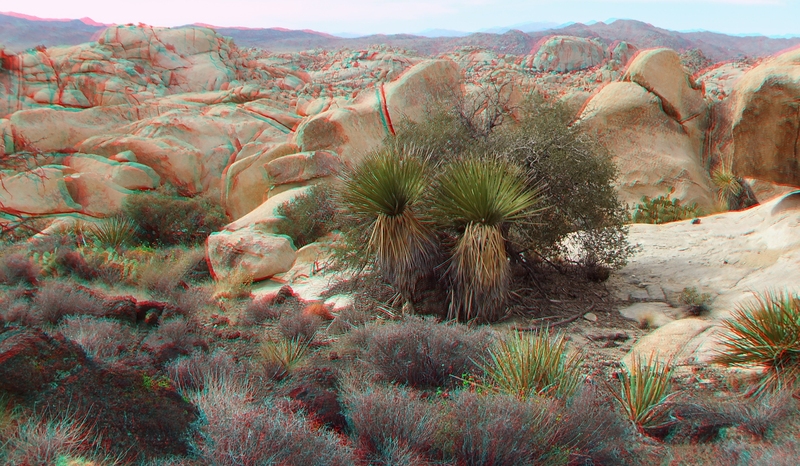 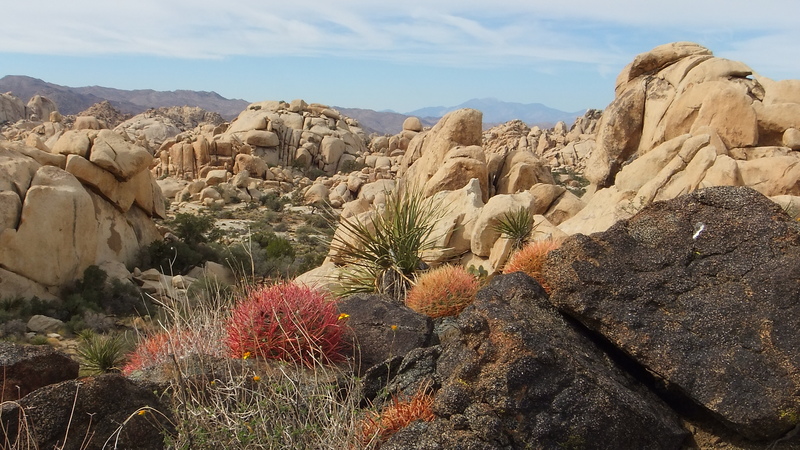 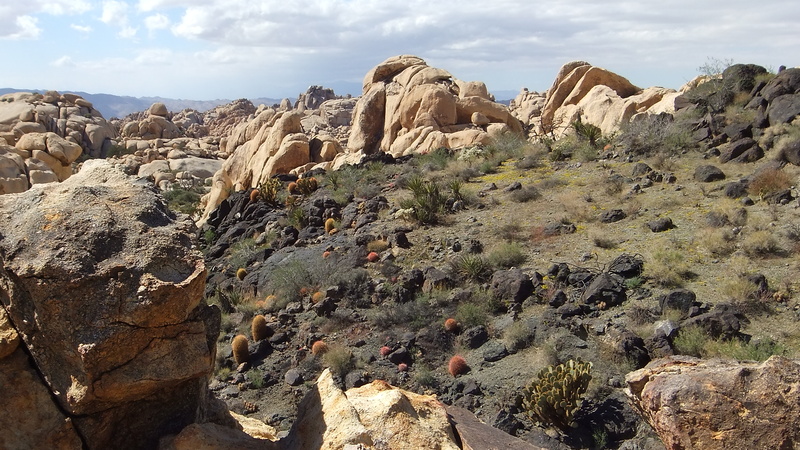 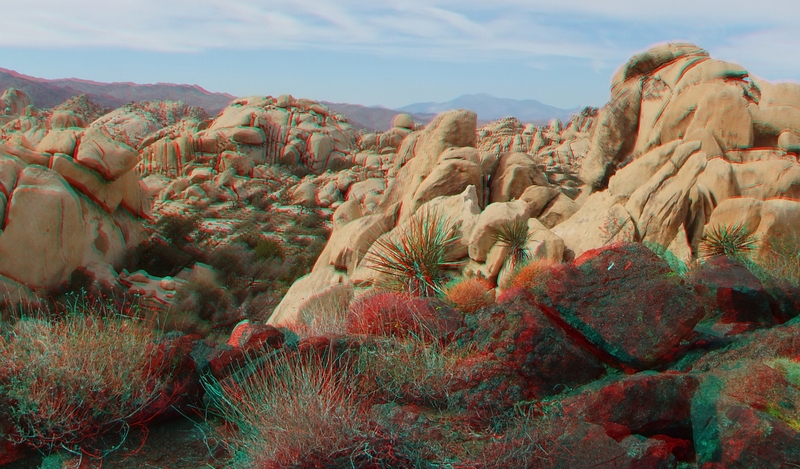 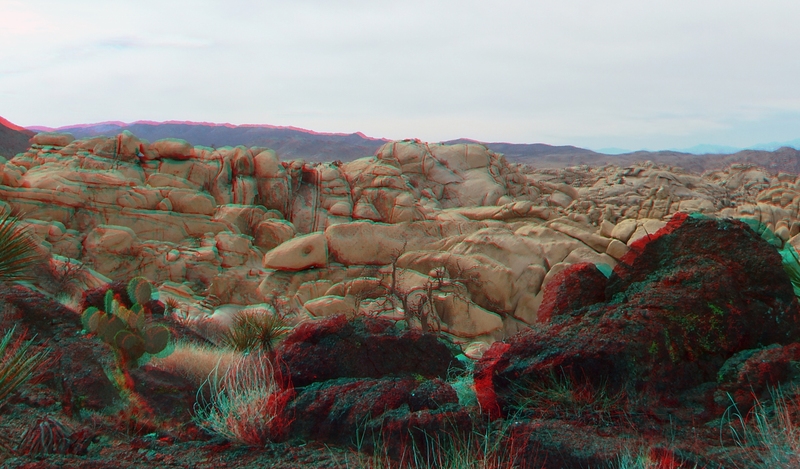 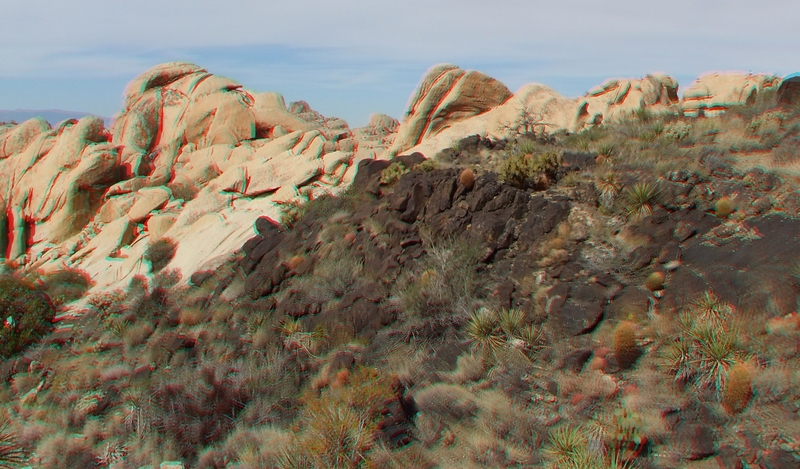 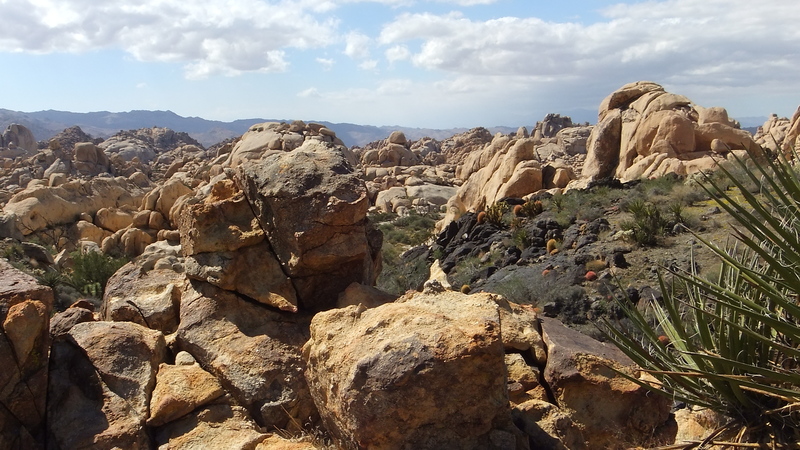 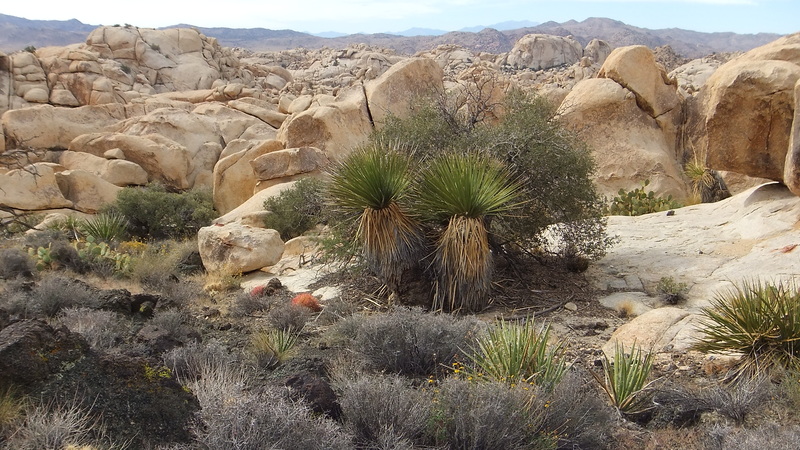 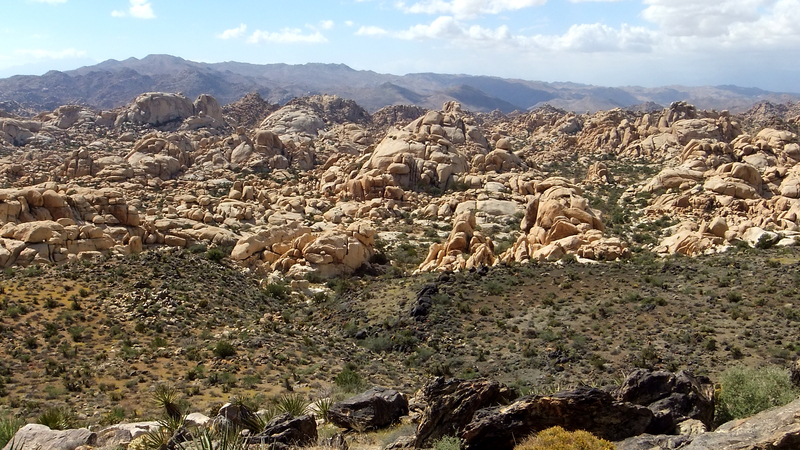 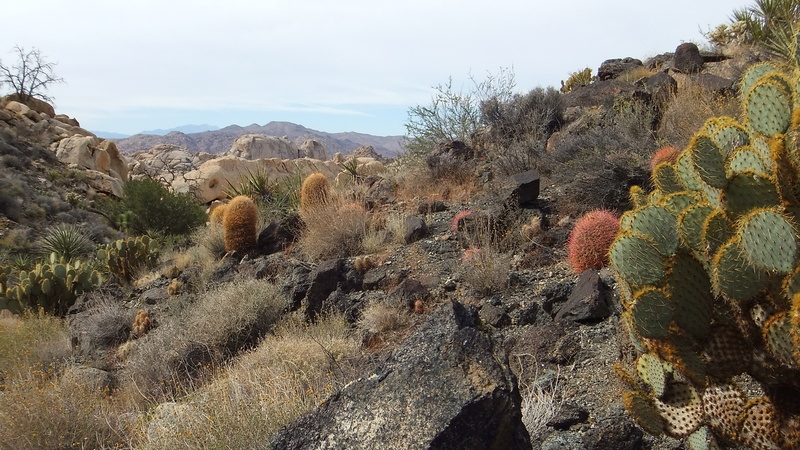 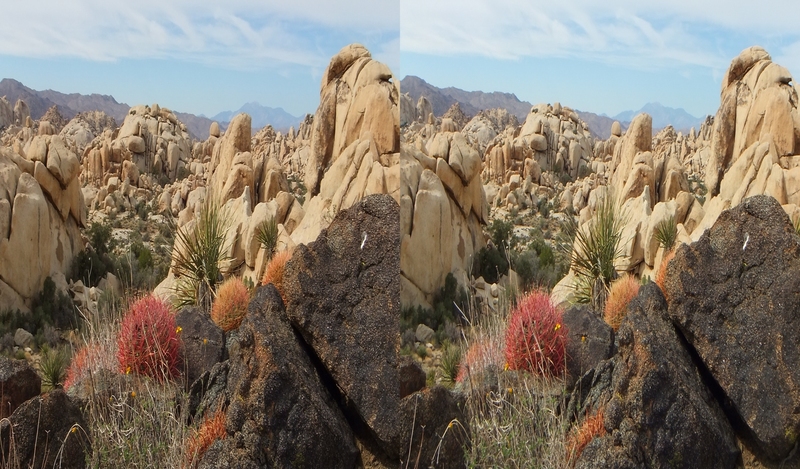 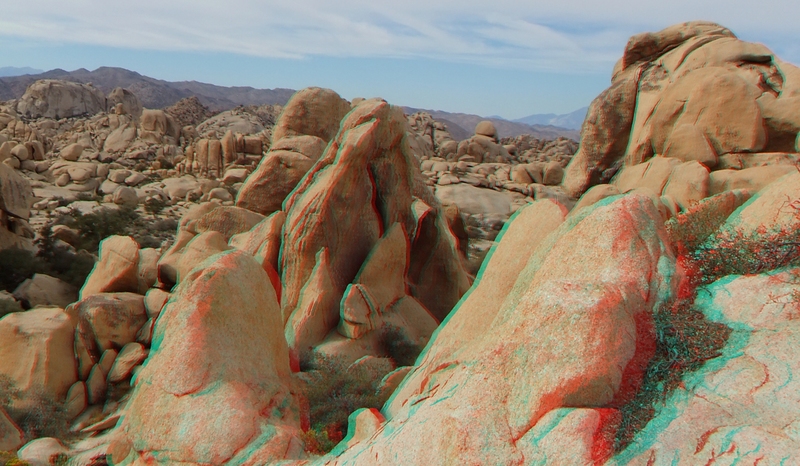 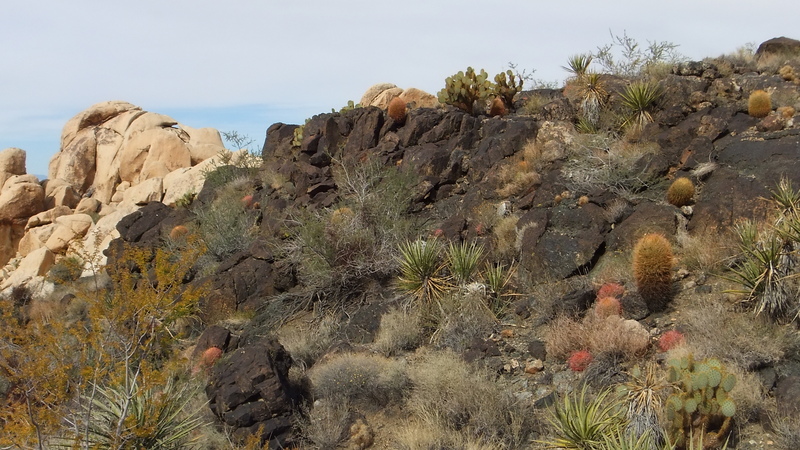 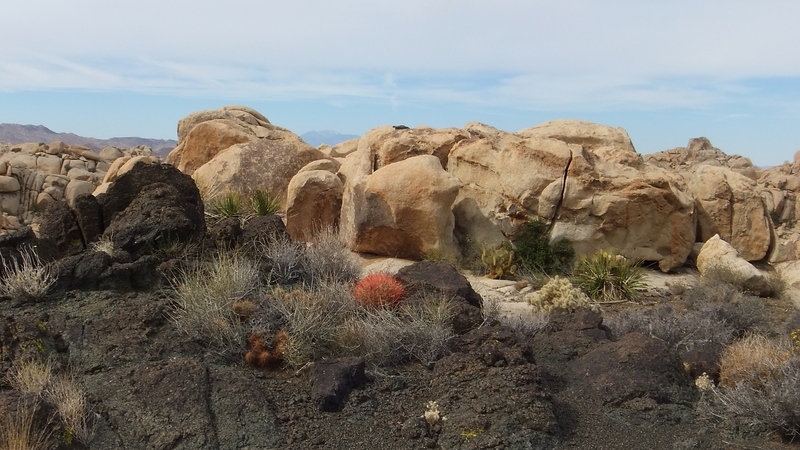 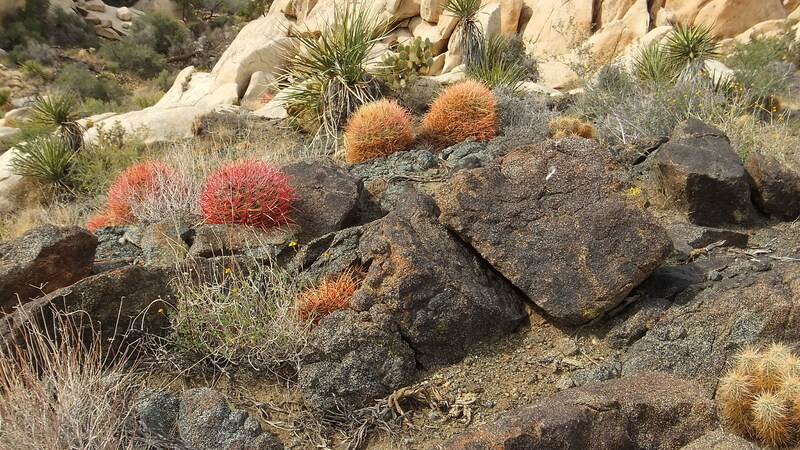 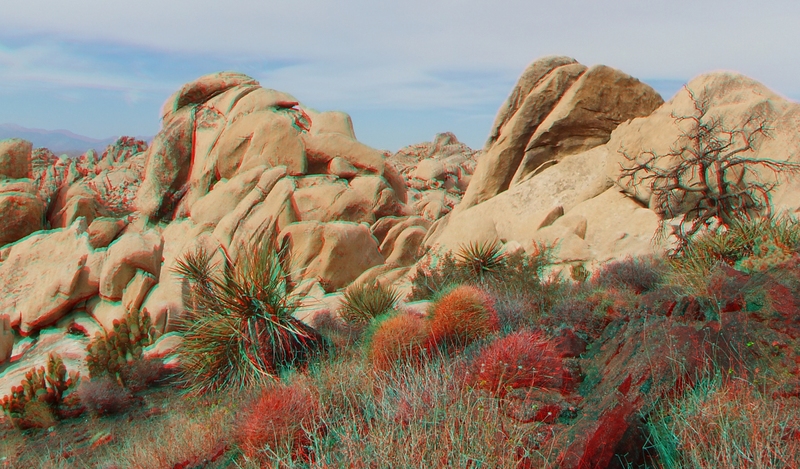 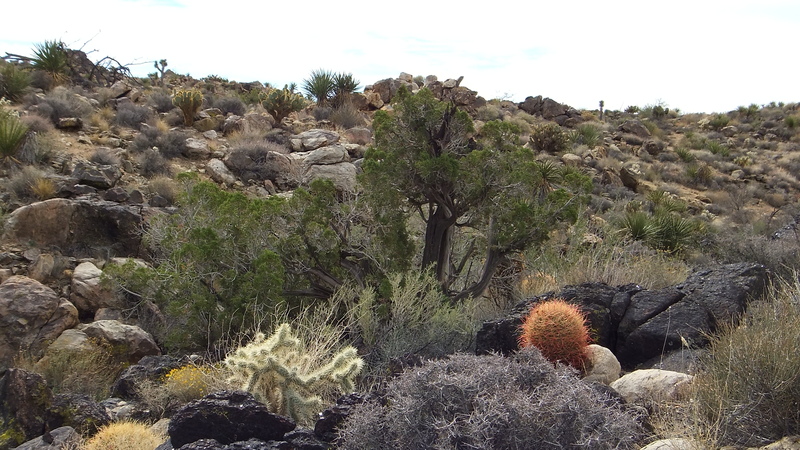 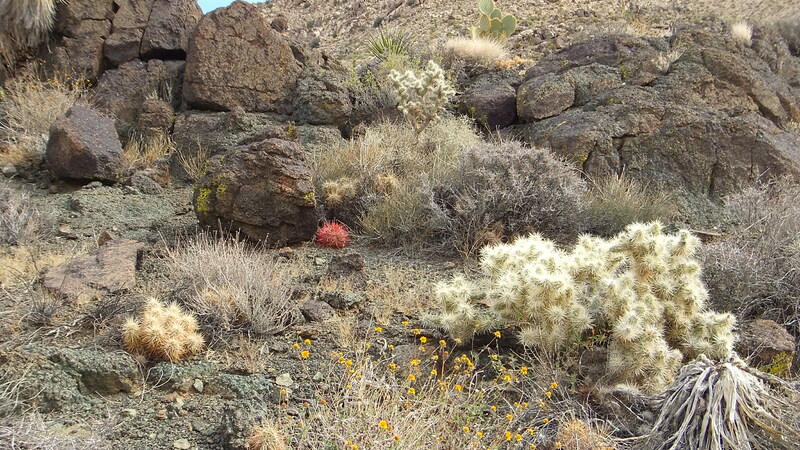 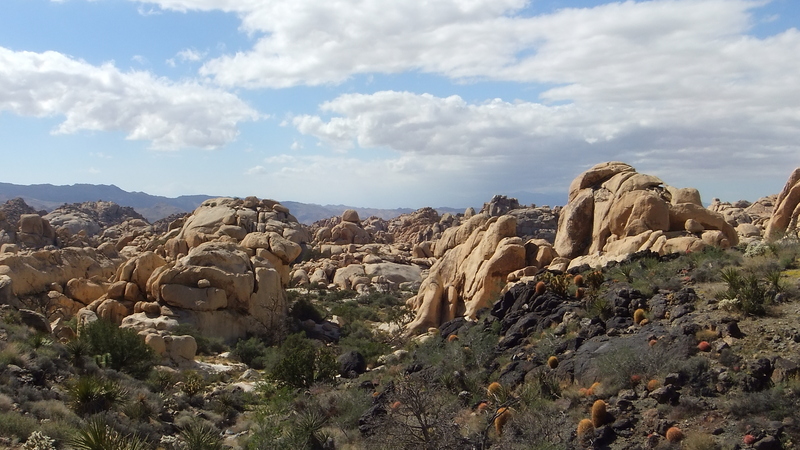 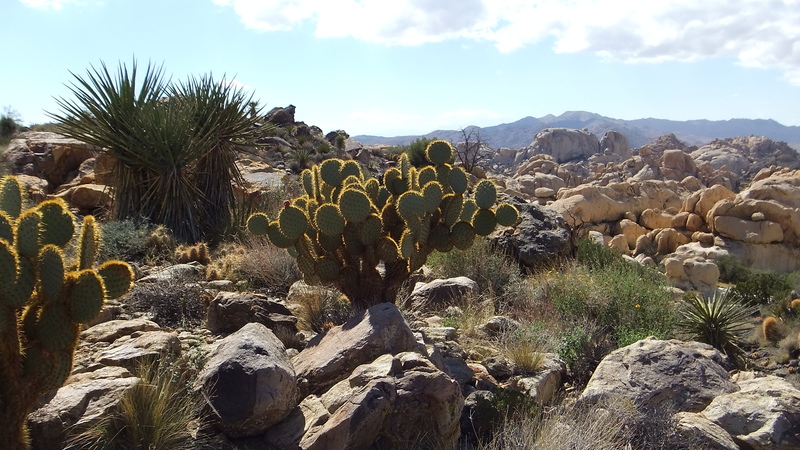 They comprise the “Crown Jewel” of Joshua Tree known as Wonderland of Rocks. 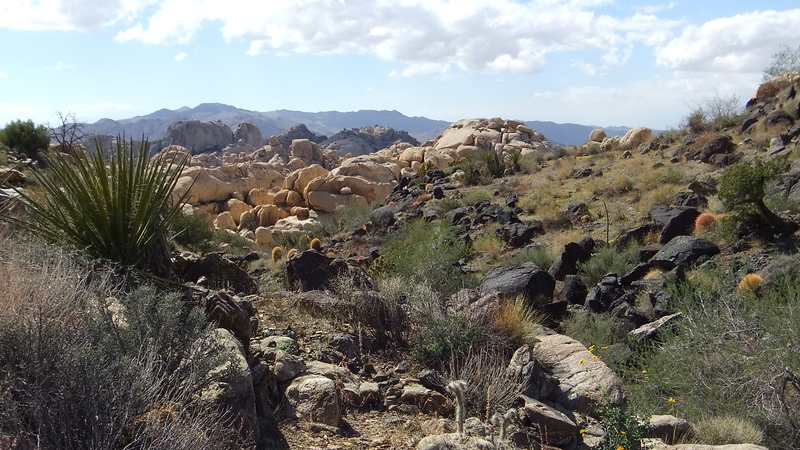 Abutting the White Tank is darker-colored granite of the Queen Mountain monzogranite series. Finally, scattered on top of the Queen Mountain hillside are leftover truly ancient boulders from a much earlier epoch, which geologists call Pinto gneiss (pronounced ‘nice’). The juxtaposition of all three is breathtaking. 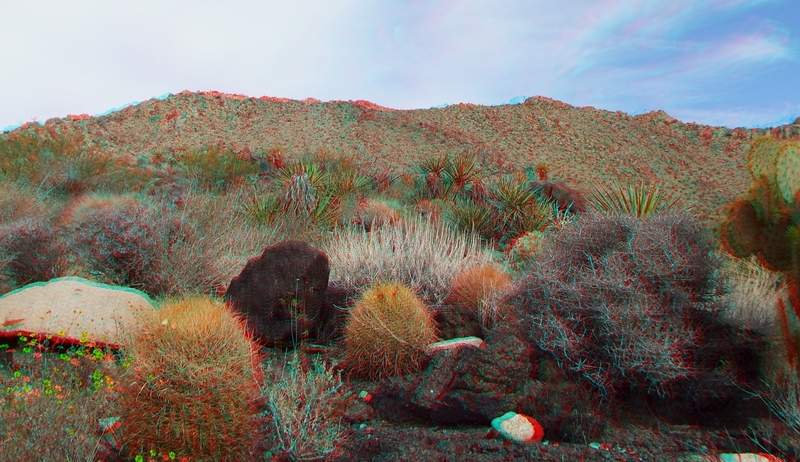 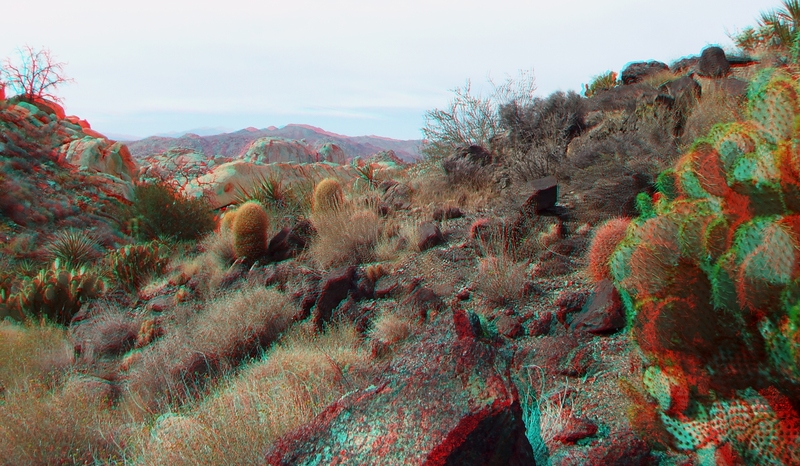 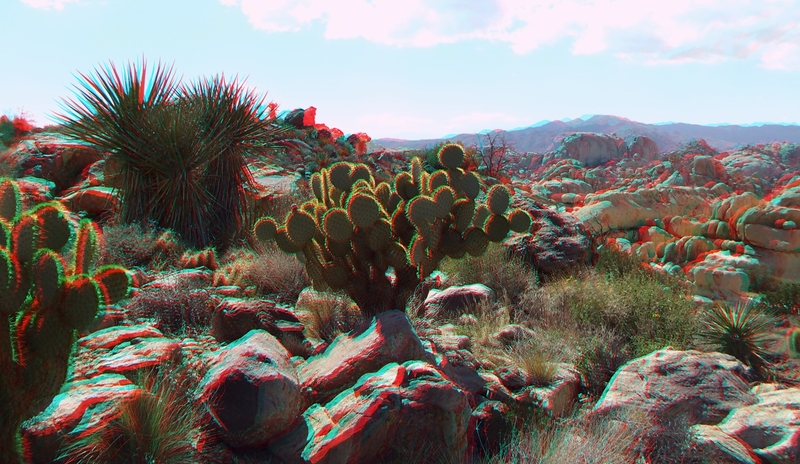 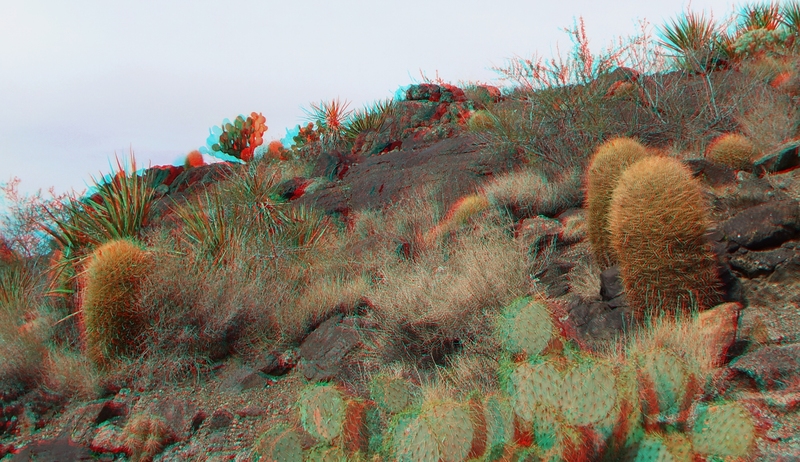 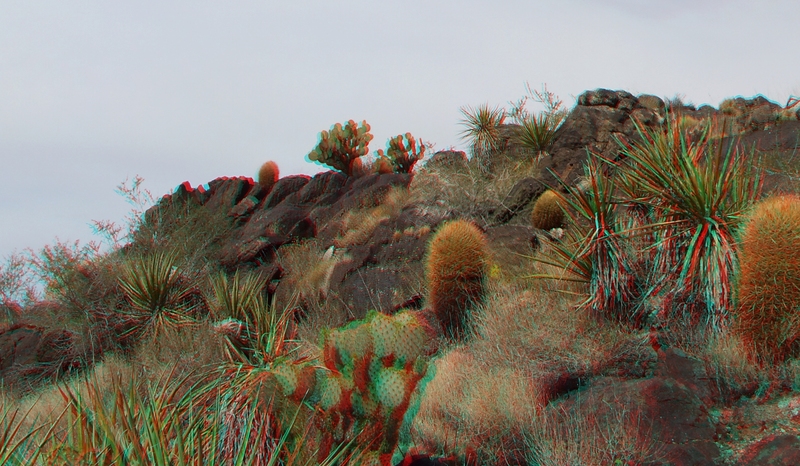 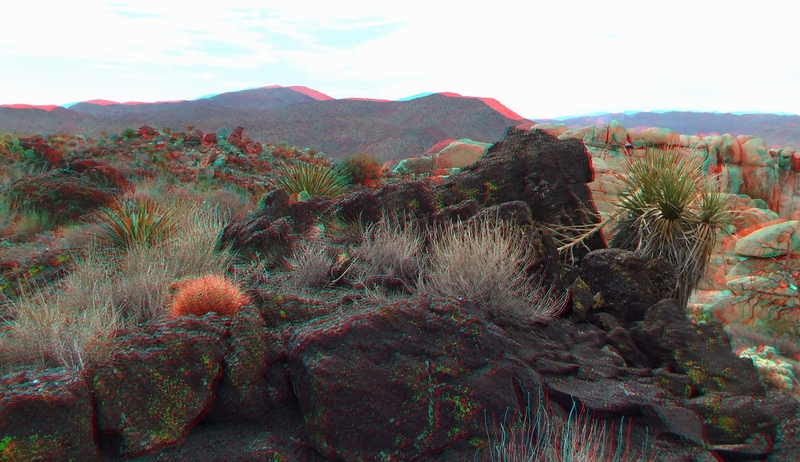 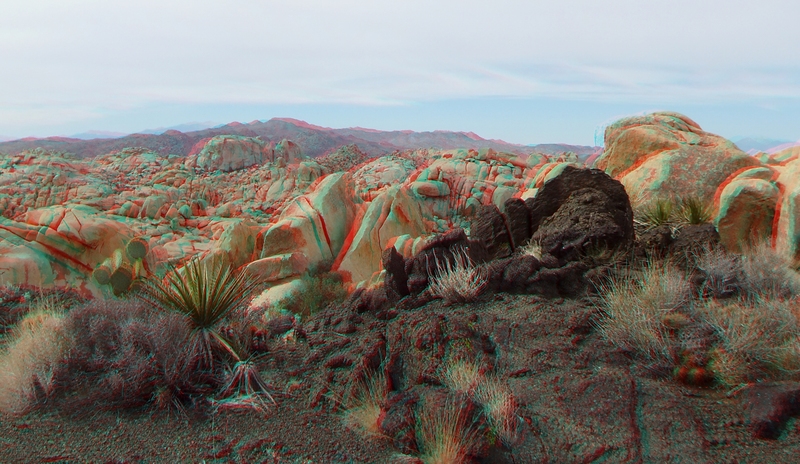 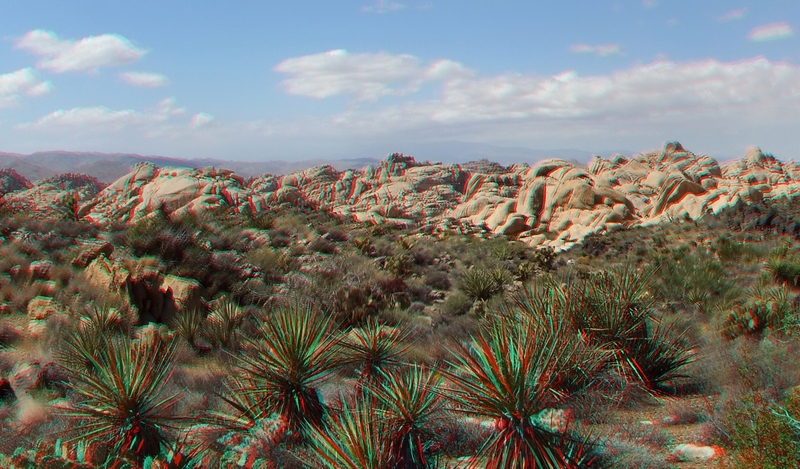 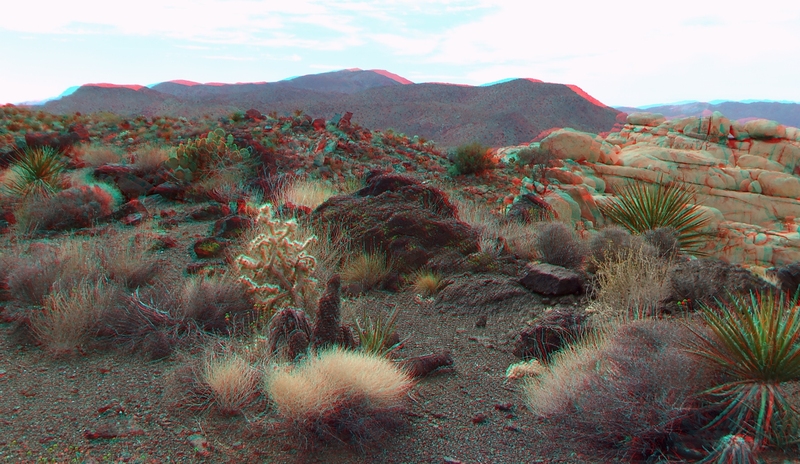 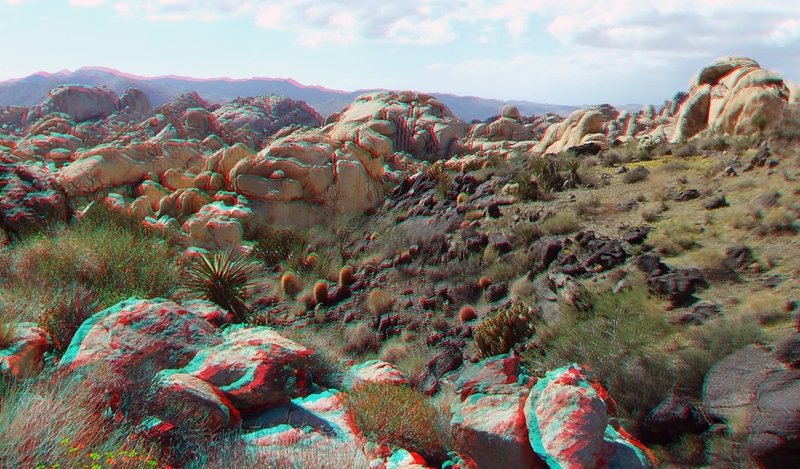 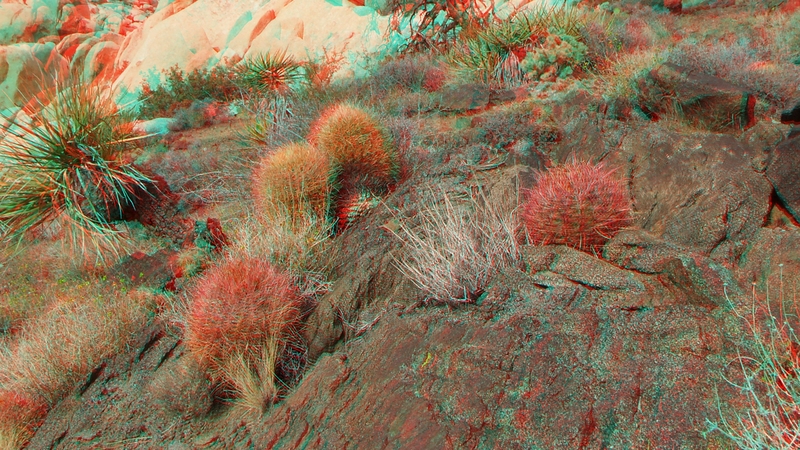 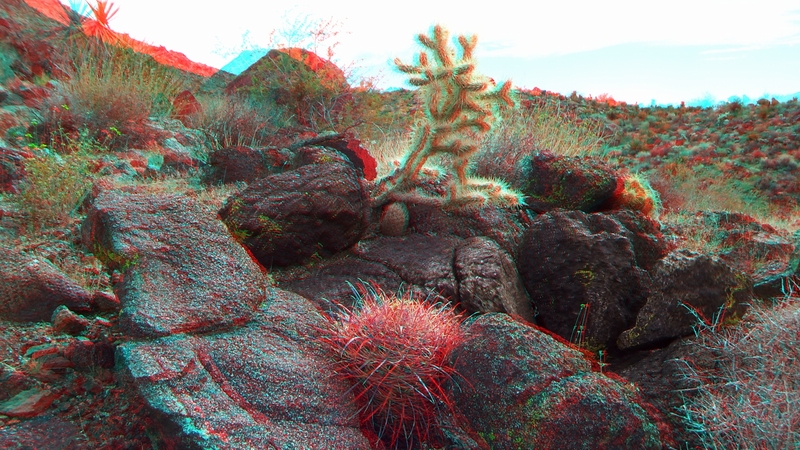 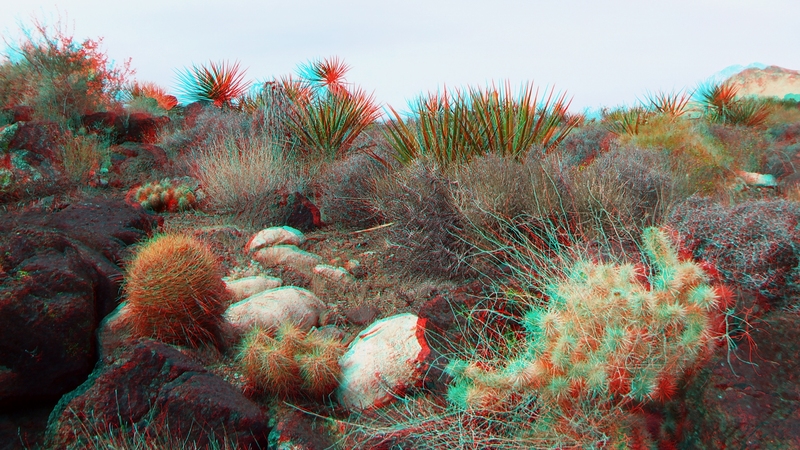 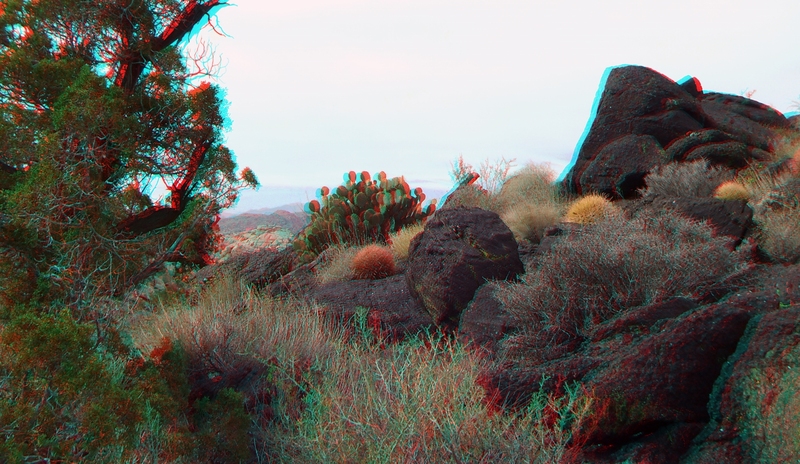 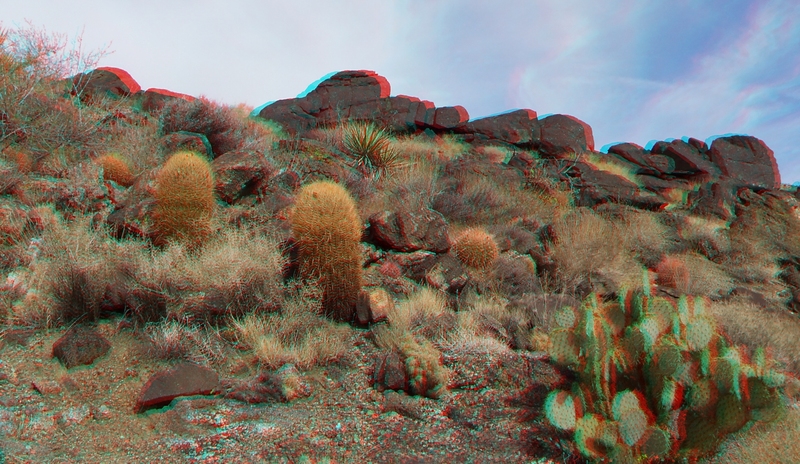 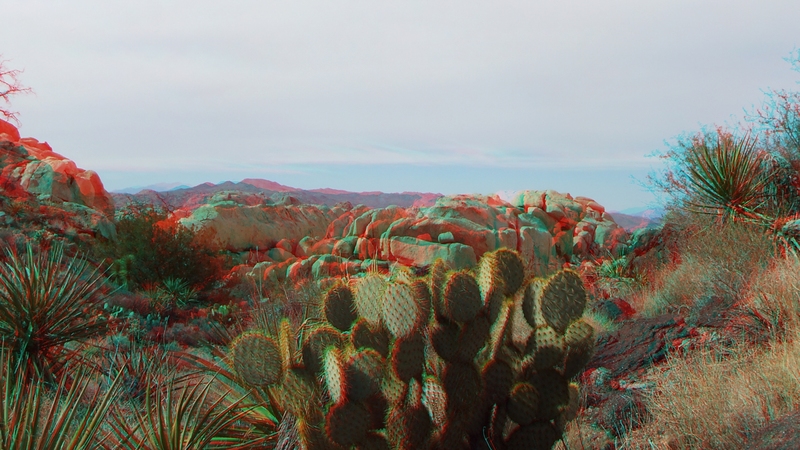 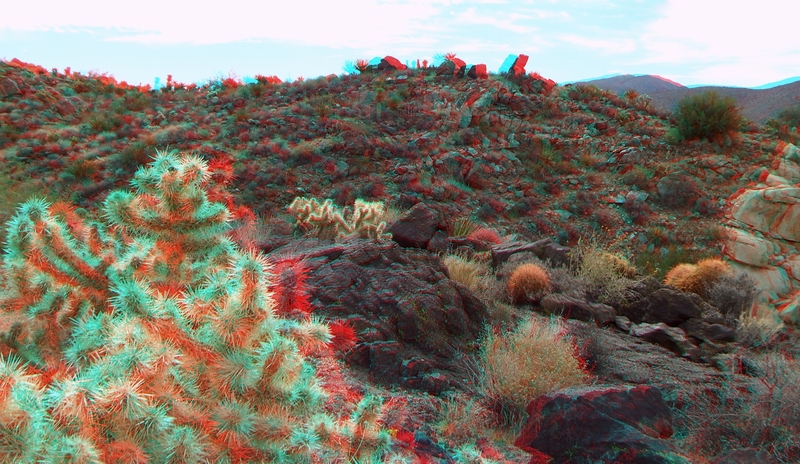 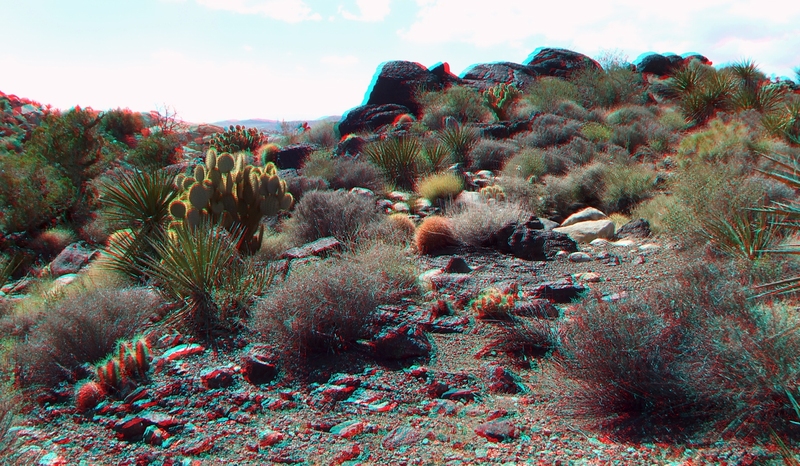 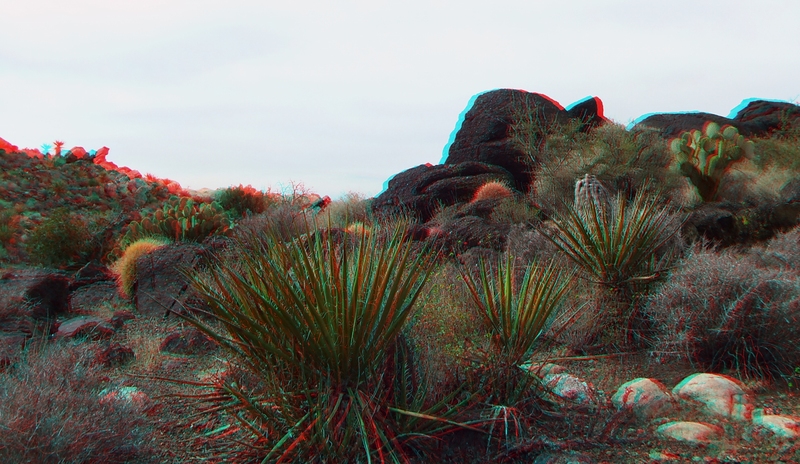 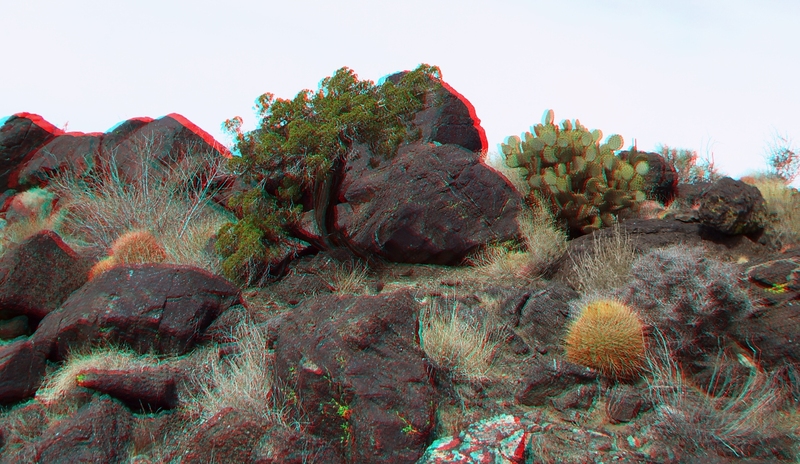 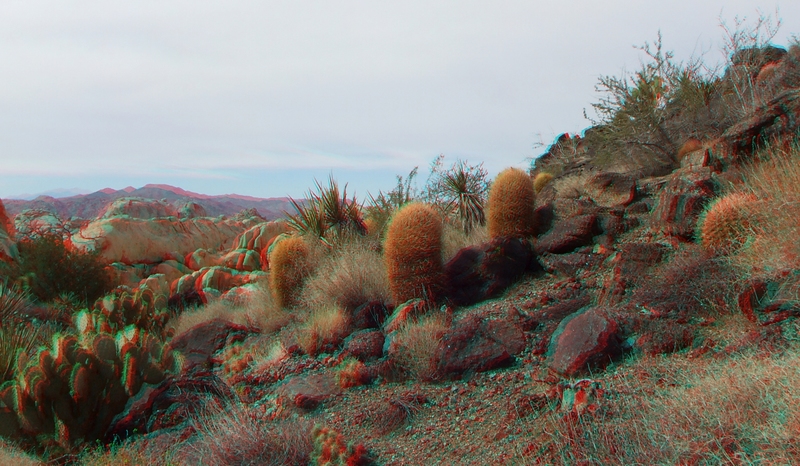 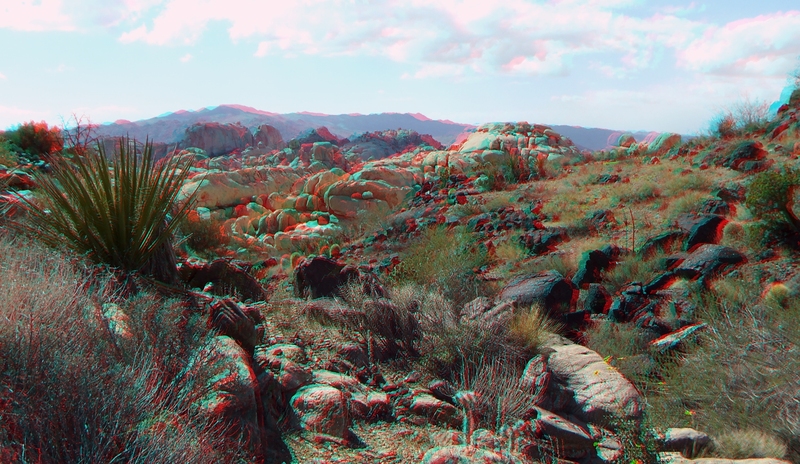 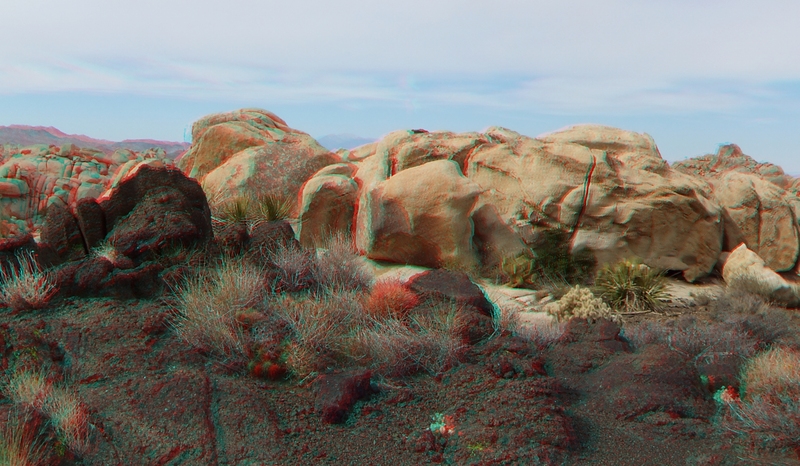 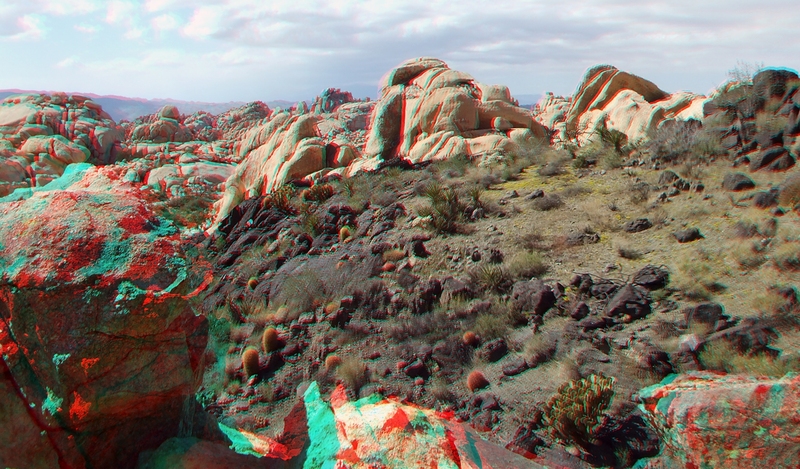 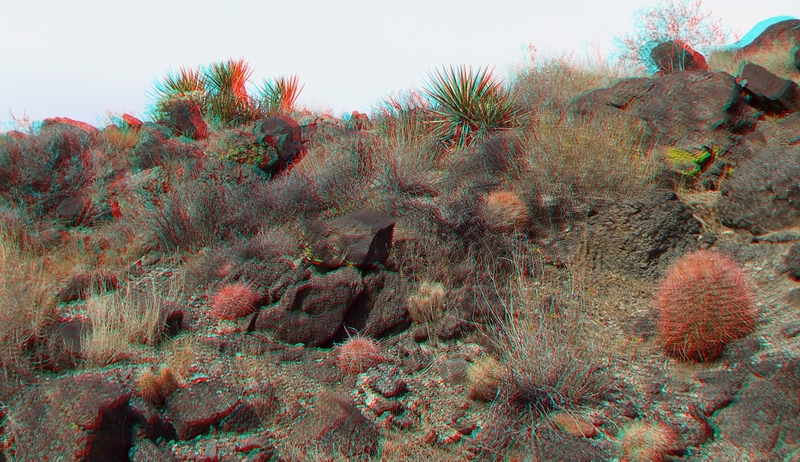 Even more so when captured in three dimensions. 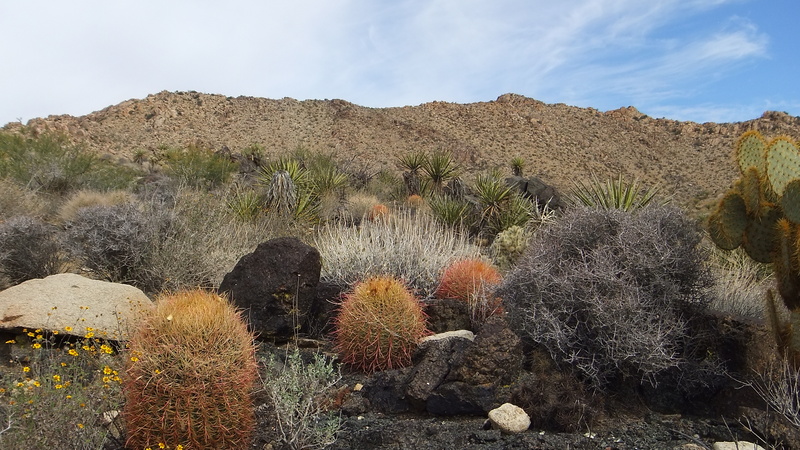 Finish off with a community of over one hundred red barrel cacti for color (I stopped counting at 90), some adorable silver chollas for their back-lit ghostly glow (don’t touch, they bite! 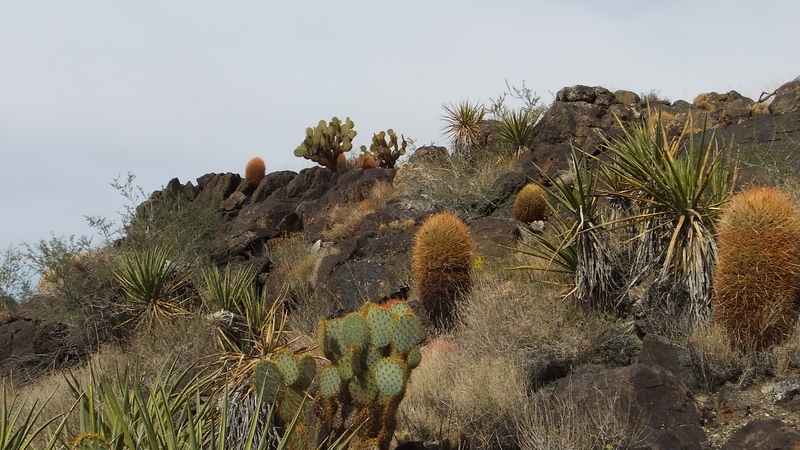 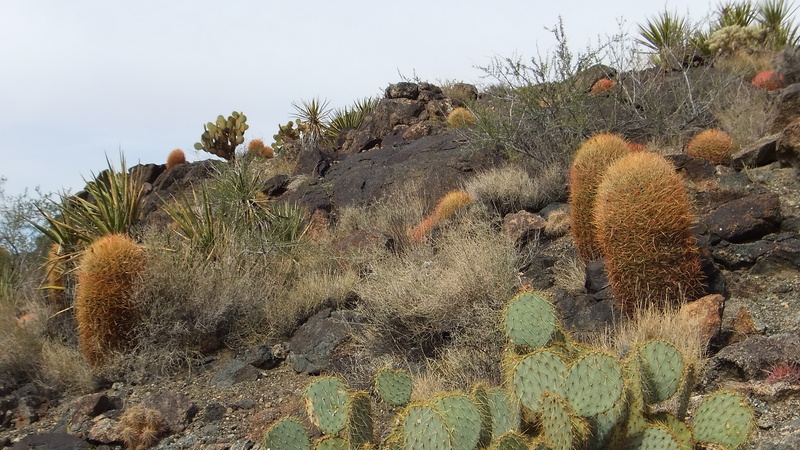 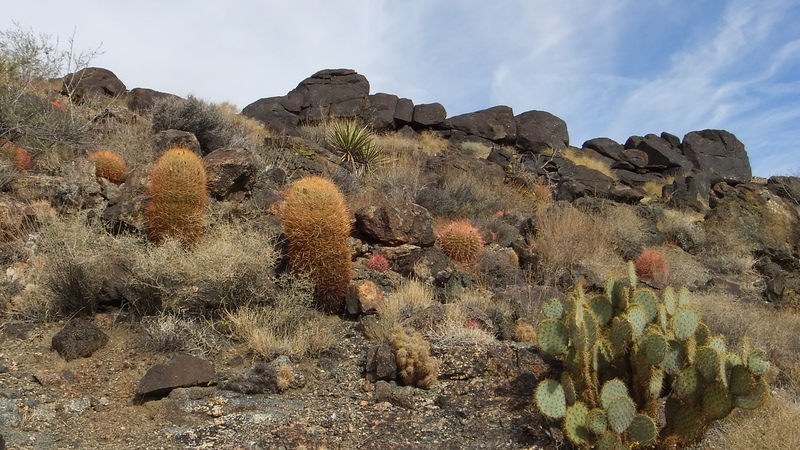 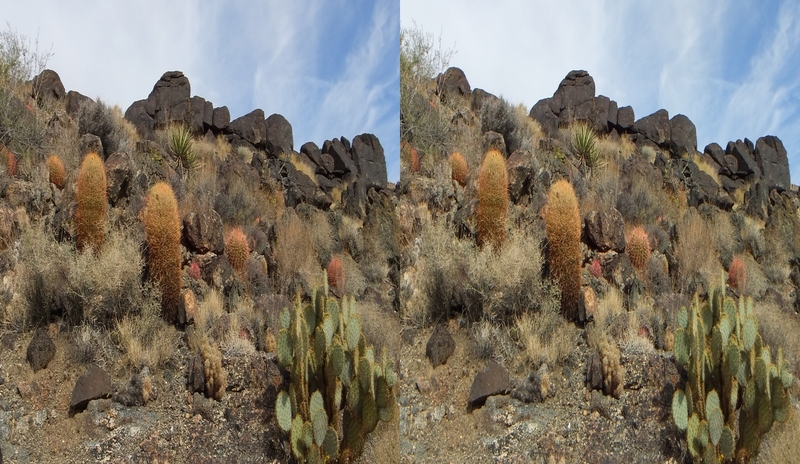 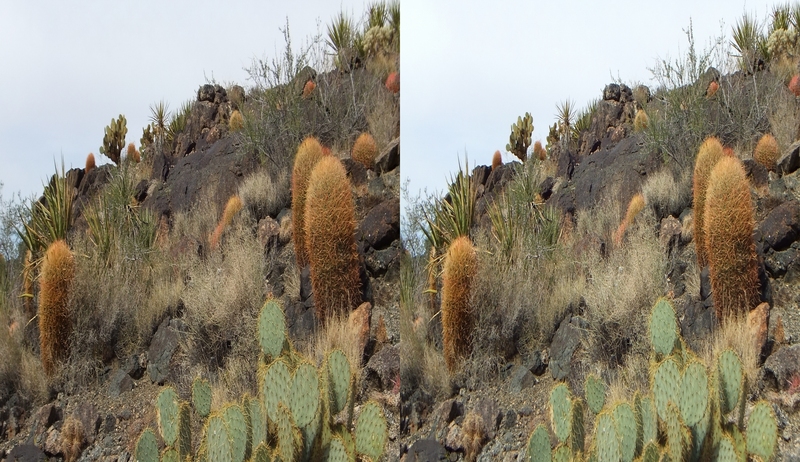 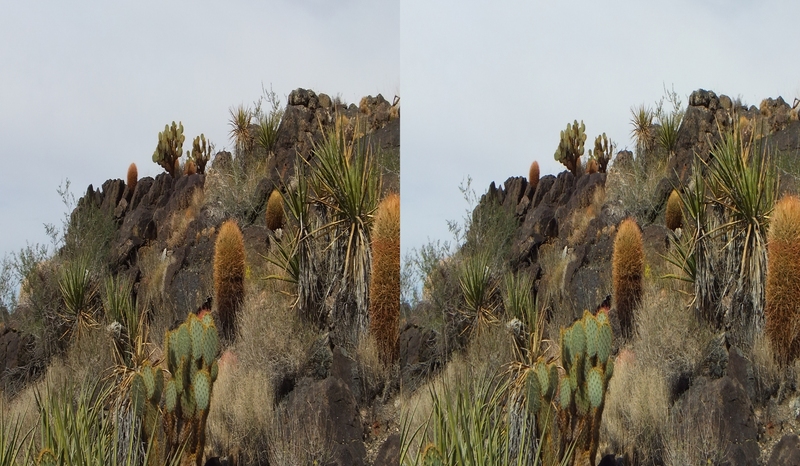 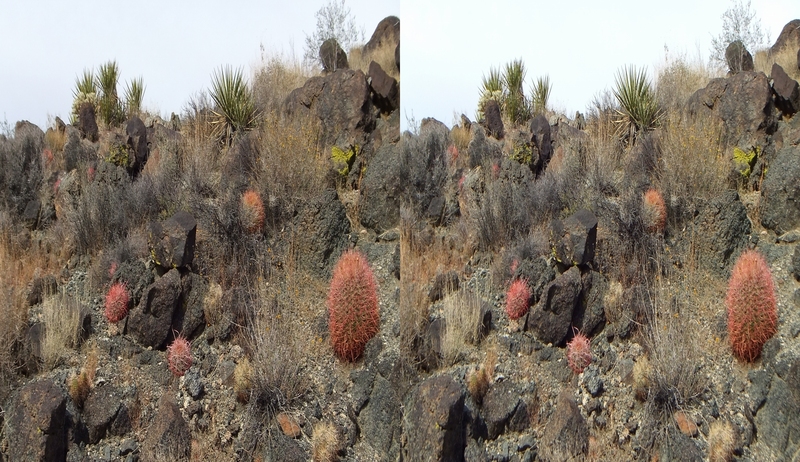 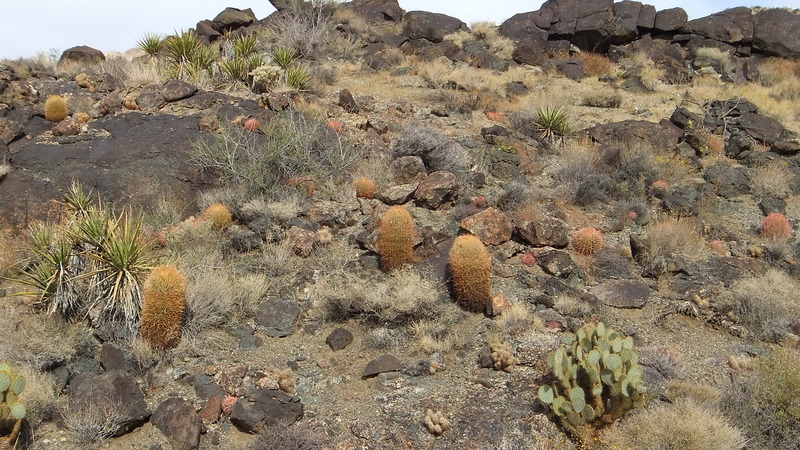 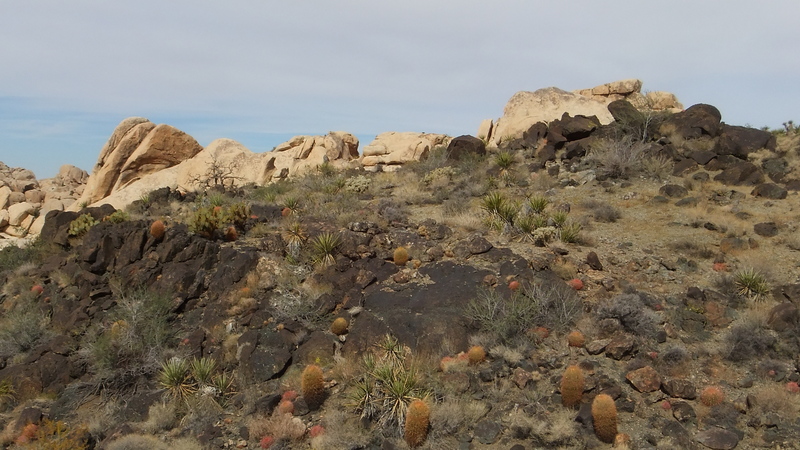 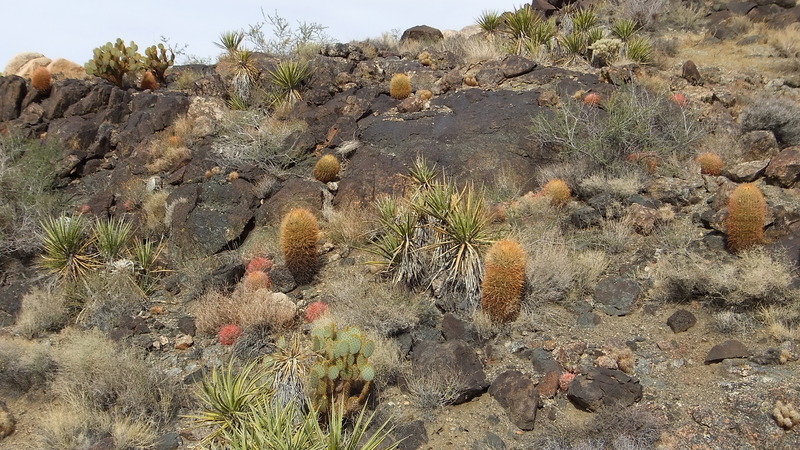 ), the usual yellow-green prickly pear with its amber-gold points—plus countless little mounds of spiny hedgehogs for contrast (watch where you step)—and you end up with a very scenic spot, one of my favorites in the Park. 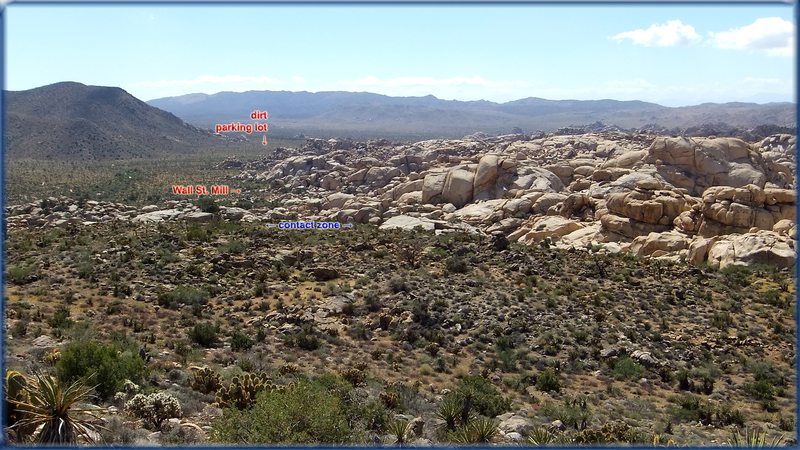 Take the old dirt road from the parking lot as though you are heading to Wall Street Mill, but veer right and go cross-country up the obvious slope adjacent to the white granite blocks. 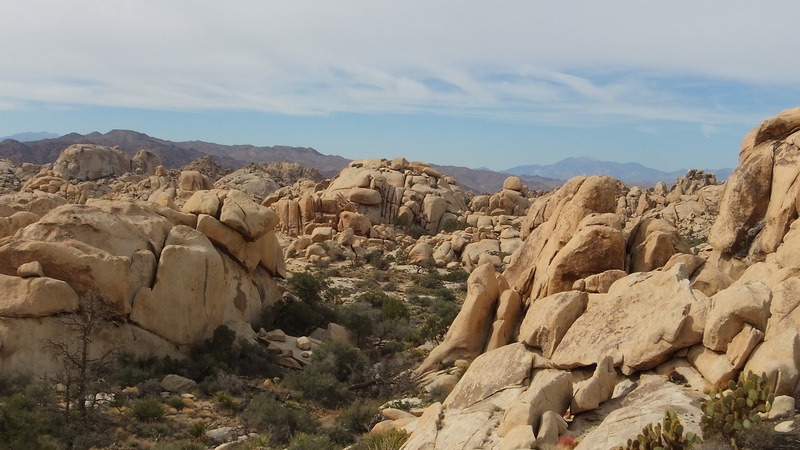 Walk along the crest of the contact zone as you enjoy the incredible views of the Wonderland of Rocks.